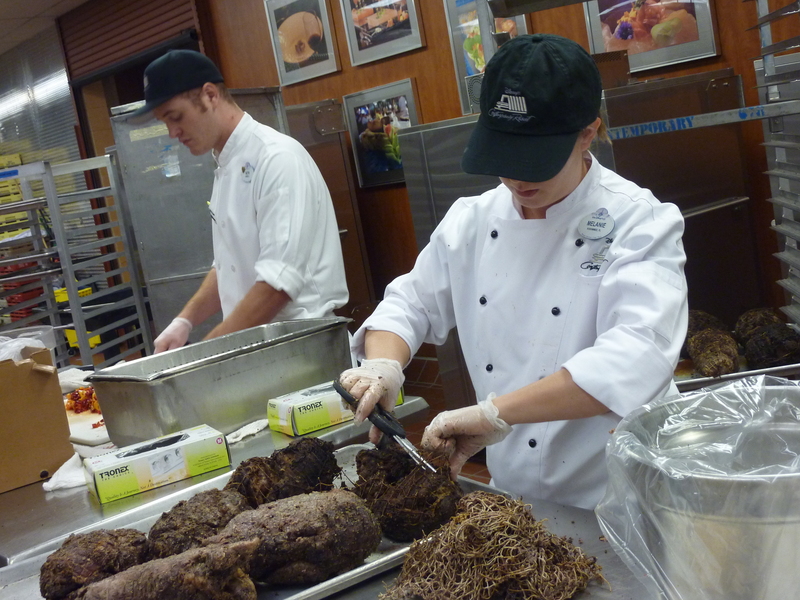 The Magic That Happens in Walt Disney World Catering! 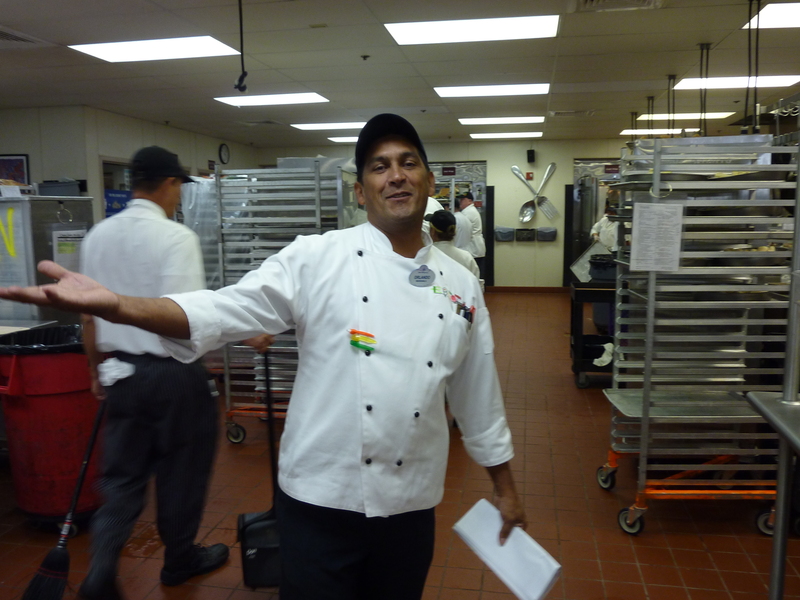 As some of you may or may not know, I spent the last 15 years working in catering at Walt Disney World. It is where I learned to boil water, as people say when you know nothing about cooking! I’ve been so fortunate to work with countless talented and creative people, and been able to be a part of many amazing events! 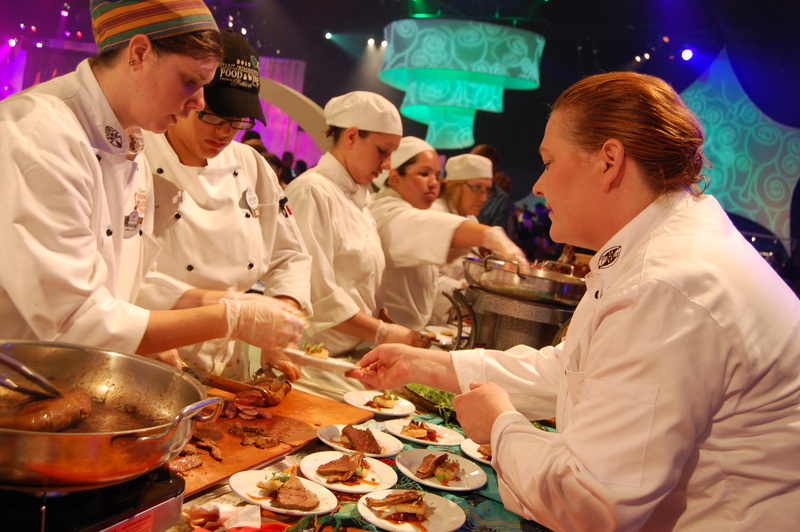 I am now switching gears now to the Food and Beverage line of business at Walt Disney World, more specifically; I am moving on to being a Sous Chef at Sanaa, at Disney’s Animal Kingdom Lodge. 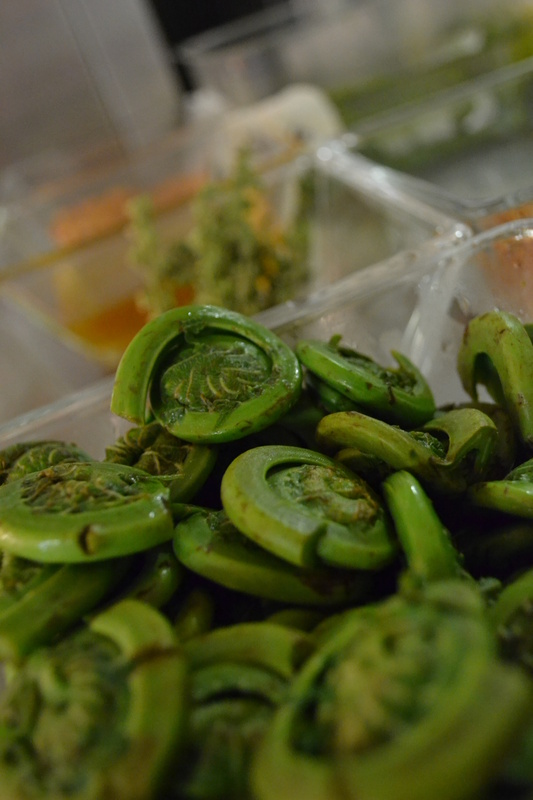 I could not have landed in a more beautiful restaurant and flavorful cuisine! I went thru my picture files for about an hour and grabbed some of my favorite pictures that capture just a few of my most memorable events. Fortunately at WDW you never have to same good bye, just until next time!!! 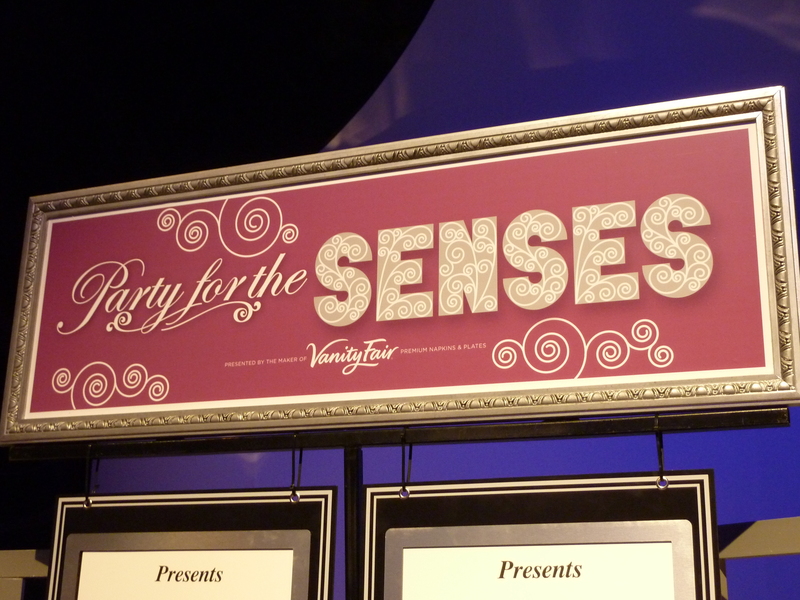 The Party For The Senses is a hard ticket event that happens every Saturday night during Epcot’s Food and Wine Festival. 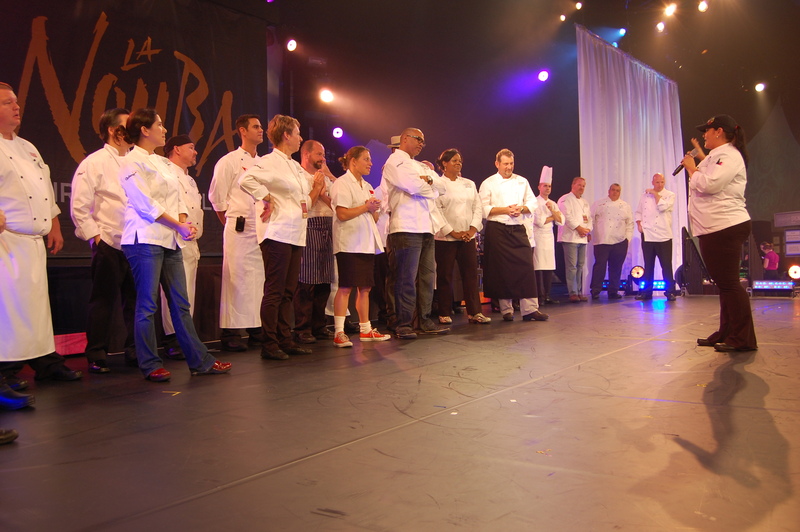 Chefs from across the world come to participate as well as many of Disney’s talented Chefs. 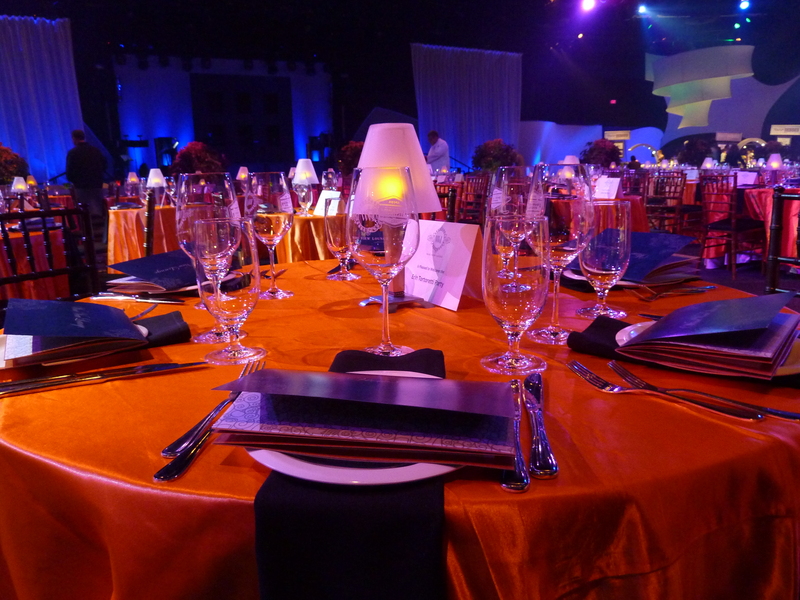 It is an event that guests look forward to all year, as well as the Disney Cast. The planning for these events is extreme and detailed, starting before the final event of the year is even finished. Happily I am getting a first hand look at these event this year, being on the Park Events team. Our Front of the House partners have taken the room to a even cooler level- the vipe of the Wine View Lounge is straight up “swank”. 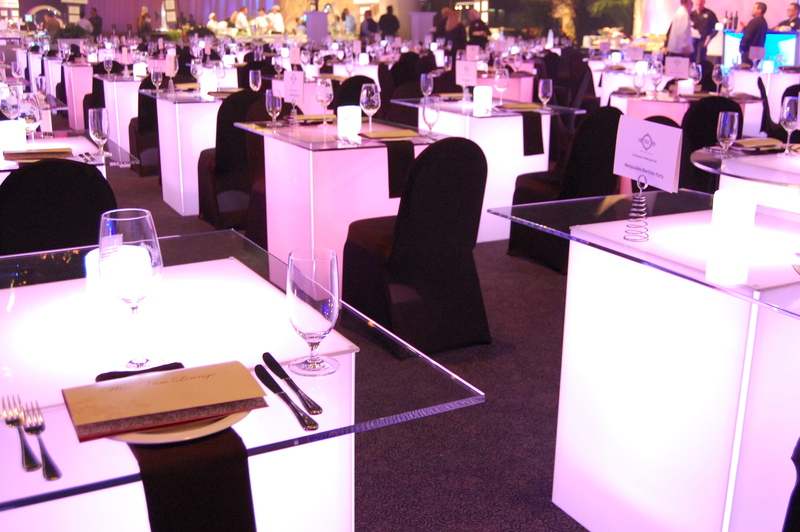 The lighting of the room and the even the tables is a perfect complement to the creativity of the food and wine being showcased. 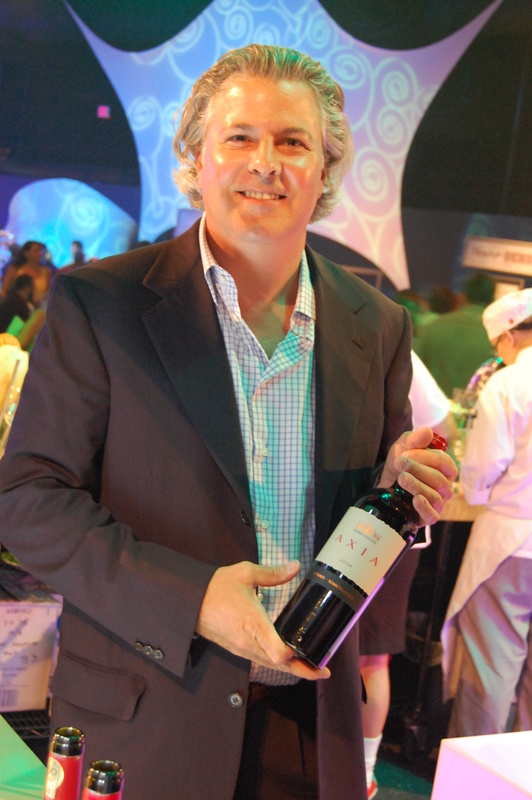 It is always great to talk to someone excited about what they are offering, displaying their passion for the products. 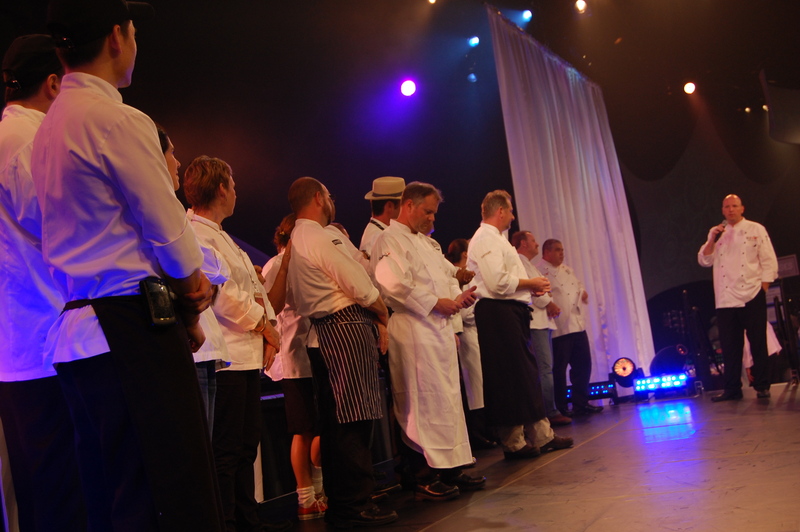 It is a pretty surreal experience to be around so many talented chefs- and the way we all engaged was even better! I walked away this weekend with a ton of ideas! 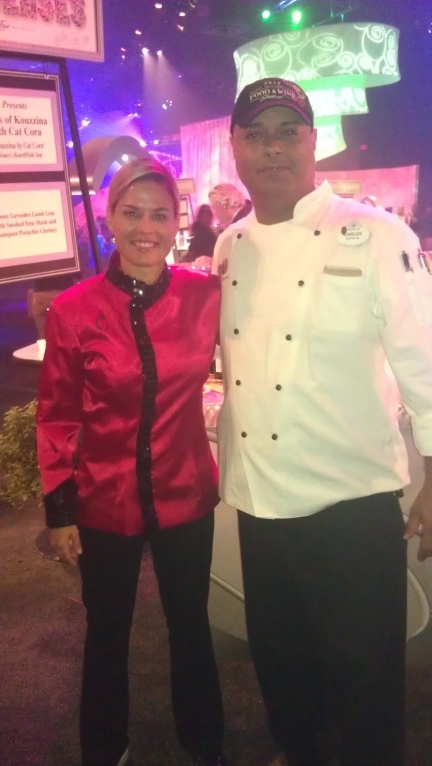 Chef Jessy and the talented team held everyone together, delivering a perfect event! I was told the reveal was something not to be missed- and it was extreme! The guests were certainly excited! 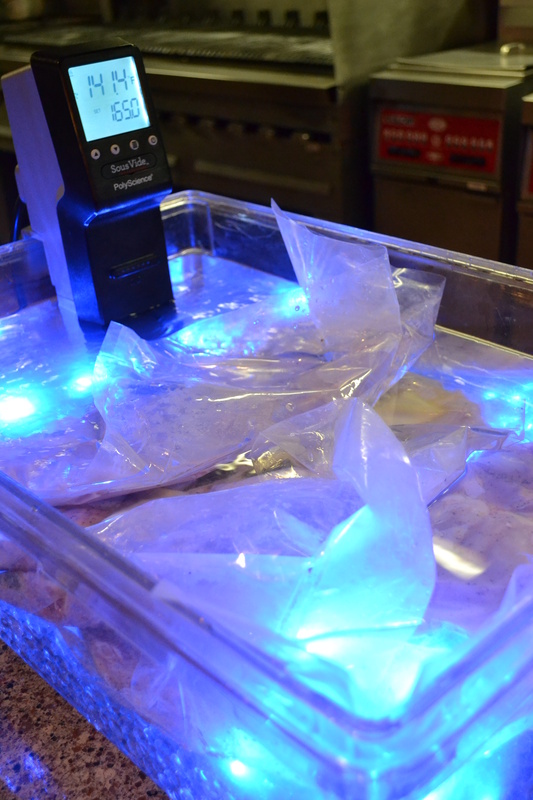 Our own Chef Damon Lauder used our new Cvap to cook Pasture Prime Pork Jowls. Was worried for a bit for not having enough, they were so popular! 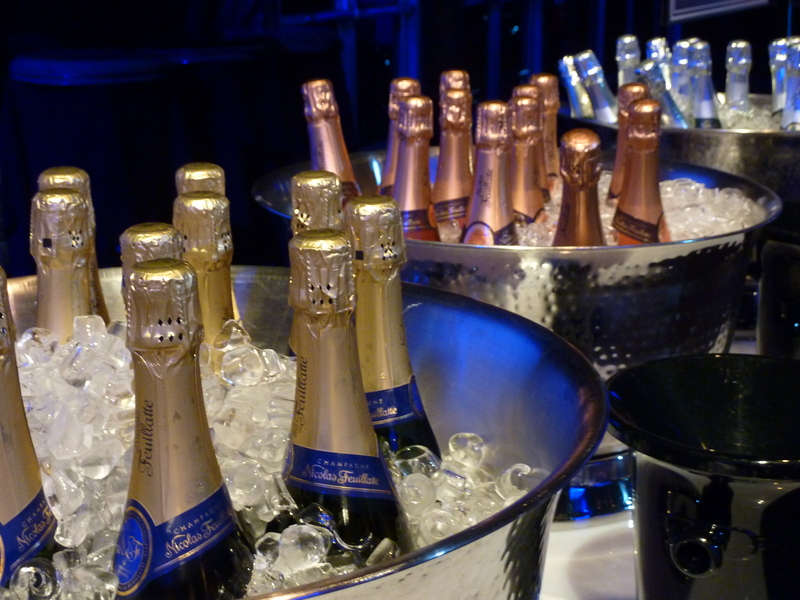 Celina Tio, a long time participant of “Party” knows what she is doing- perfect flavors and perfect amount of product! 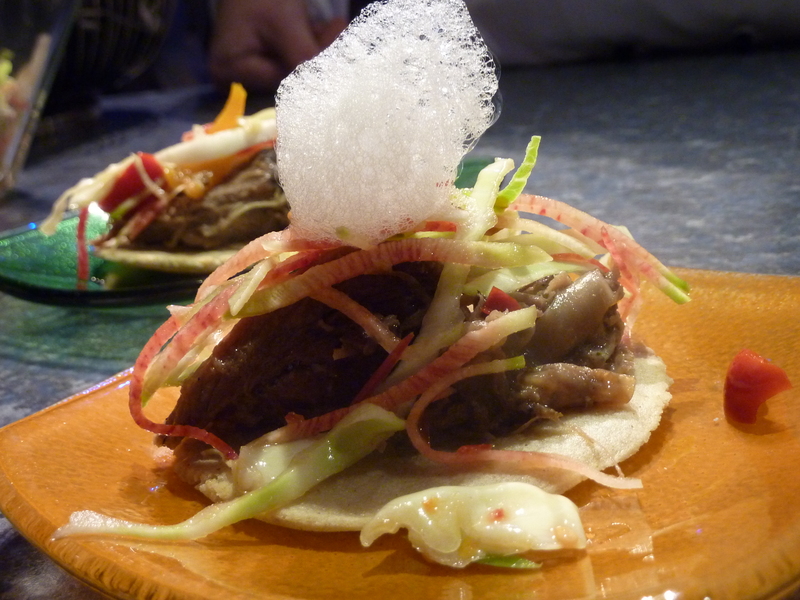 The Tio team was a pleasure to have in the kitchen for a few days! 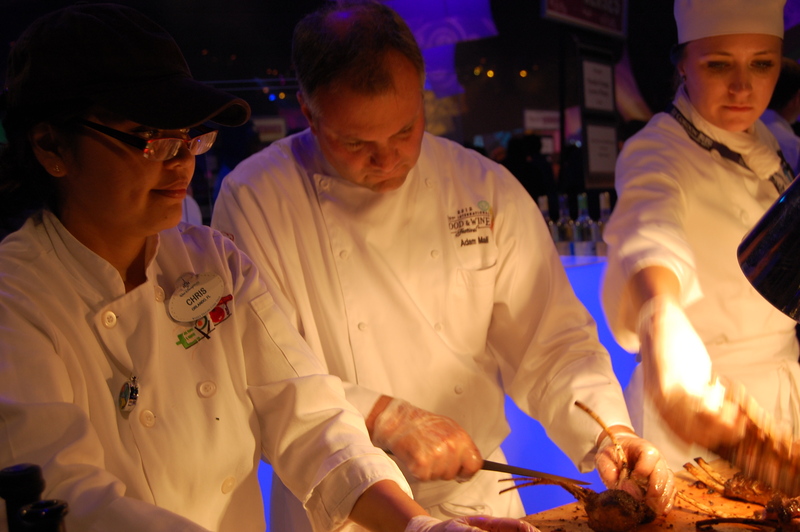 All of the participating Chefs and teams delivered flavorful and creative dishes. AND….they had fun, kids included! They also worked hard! The King and Queen of Pork included! 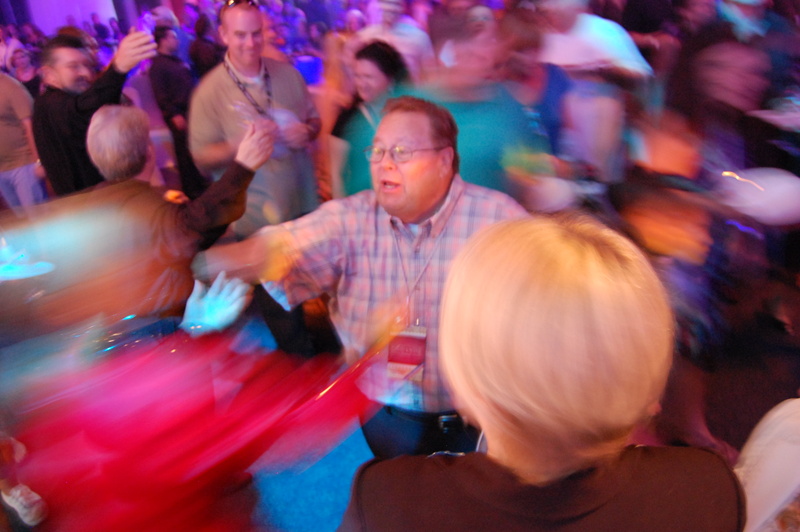 Party for the Senses is always a blast, seeing friends from wayback and creating brand new friendships…even thru twitter. 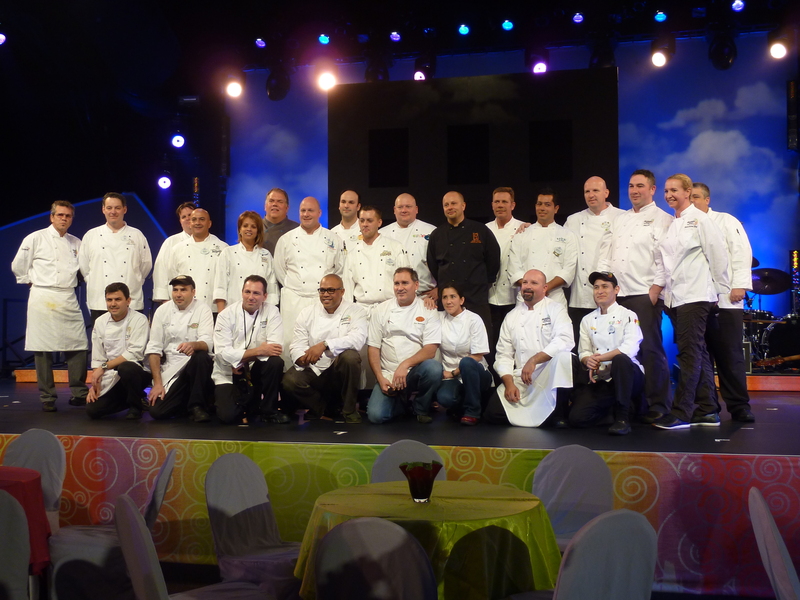 It has been such a great experience to be a part of the #EpcotFoodFestival this year, so fun to get to know so many talented Chefs, and to support their success! 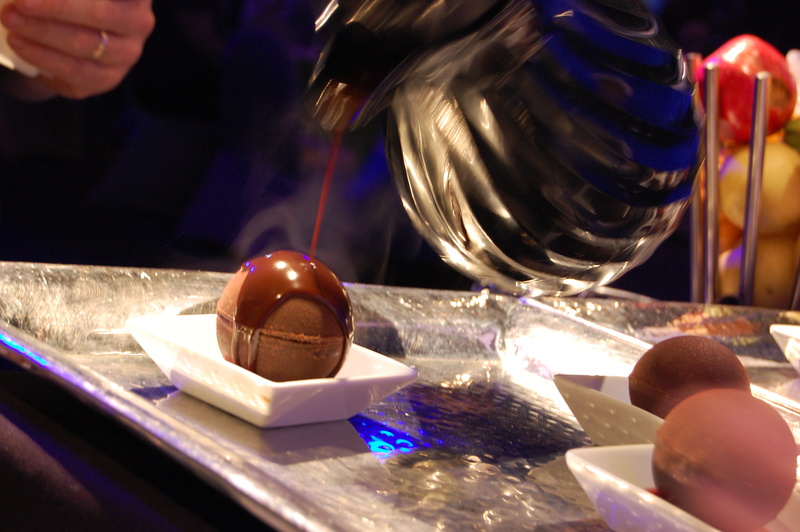 Some of the best looking and tasting desserts had…I renamed the sphere, “Noahsphere” in honor of Chef Noah French, who made it. 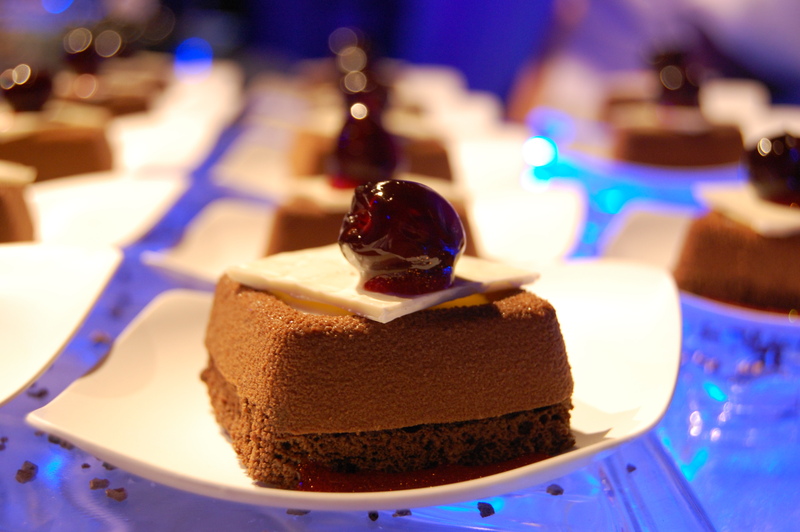 I guess it is clear that I lean towards the chocolate desserts. 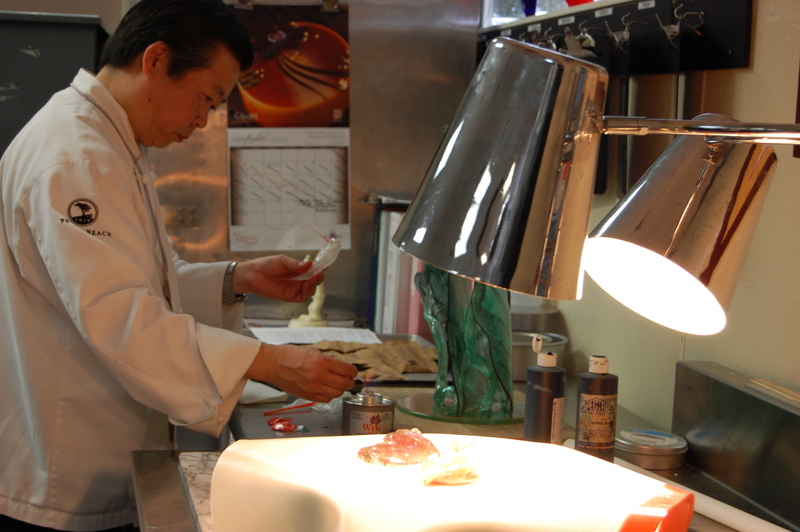 I was captivated by Chef John Hui and the sculpture he did. I spent a few minutes gawking as he nonchalantly threw together a sugar hummingbird. Walked away amazed, after I told him, I completely got it- and thanks for the lesson, I’ll throw one together on my next day off. He laughed. and then laughed again. What a great few weeks it has been, hard, but so worth it. I can’t wait to see the rest! 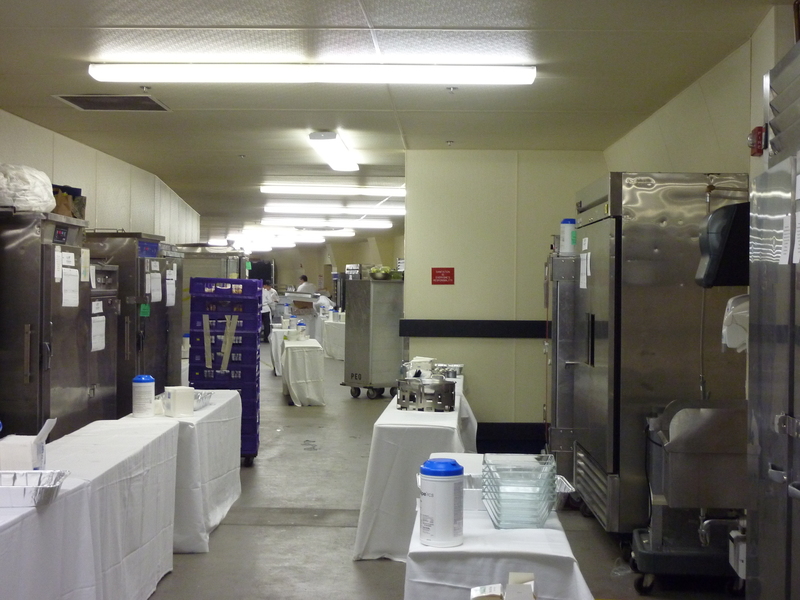 Party For The Senses 11/5/11- From Behind The Scenes! 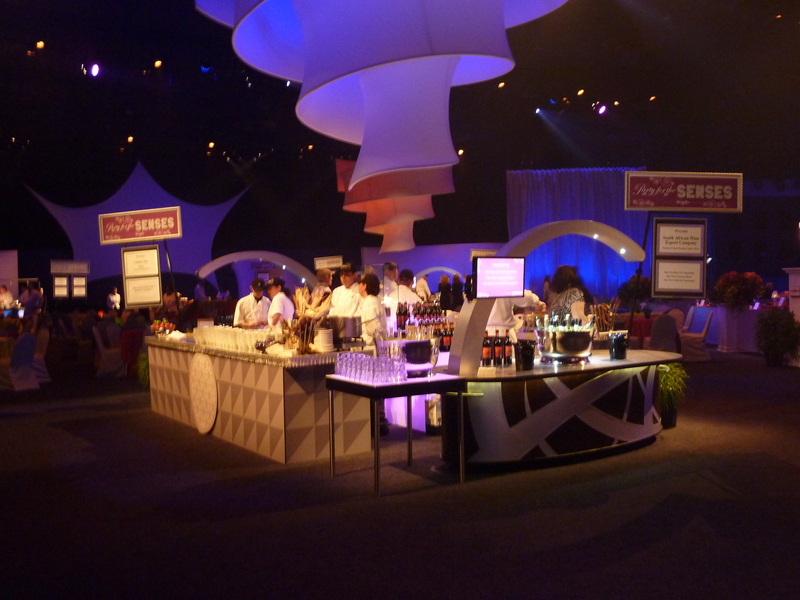 The Party For The Senses is a hard ticket event that happens every Saturday night during Epcot’s Food and Wine Festival. 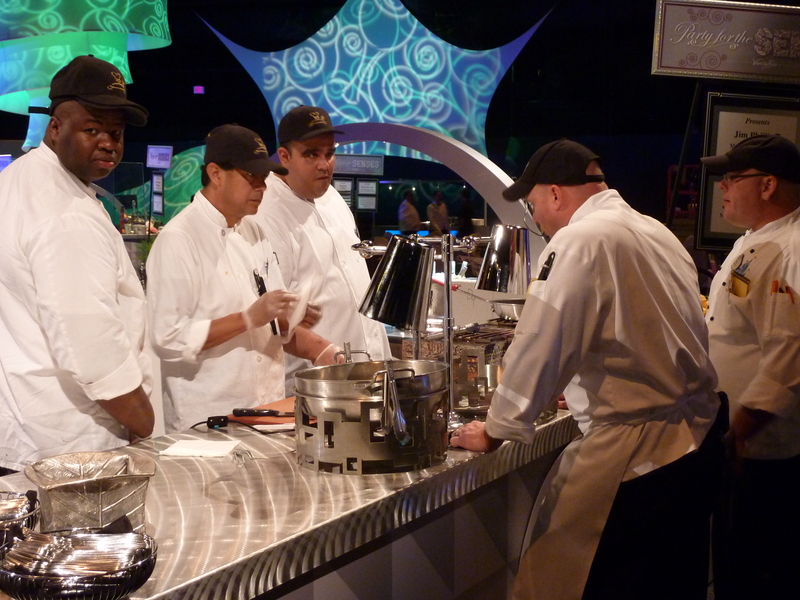 Chefs from across the world come to participate as well as many of Disney’s talented Chefs. 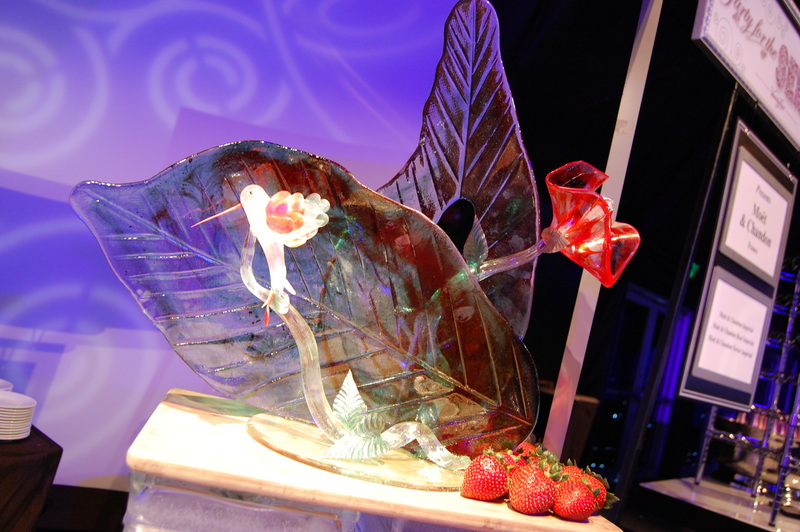 It is an event that guests look forward to all year, as well as the Disney Cast. The planning for these events is extreme and detailed, starting before the final event of the year is even finished. 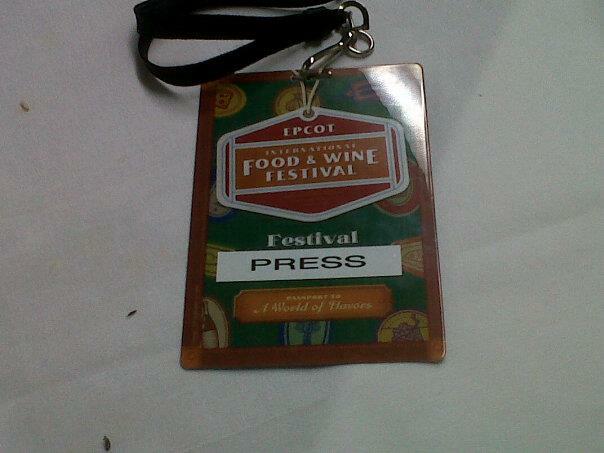 I was lucky to get my press pass for the event! . The prep of each chefs dish starts a few days prior to the event, we started cooking the Wild Boar in plenty of time to get it tender enough. Seth and Melanie are doing a bit of prep for the event. 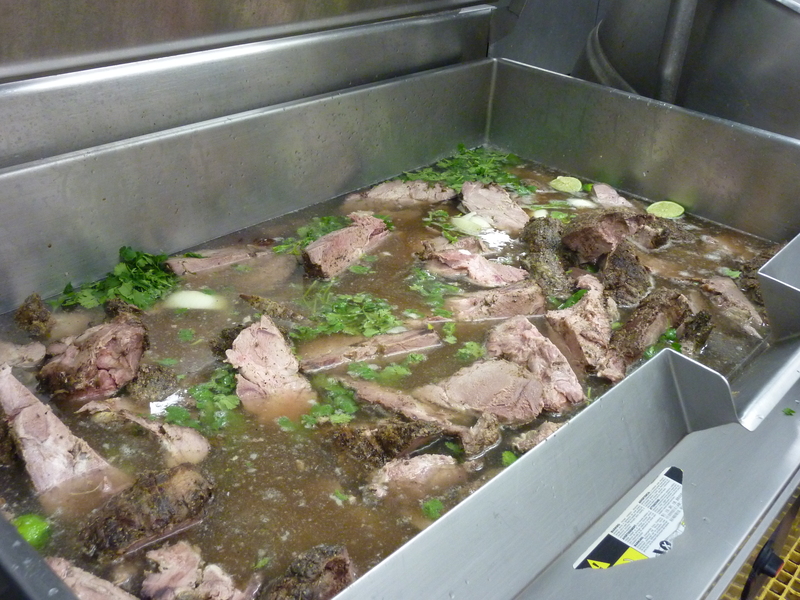 The Wild Boar is slowly cooking, soaking up a ton of flavor! 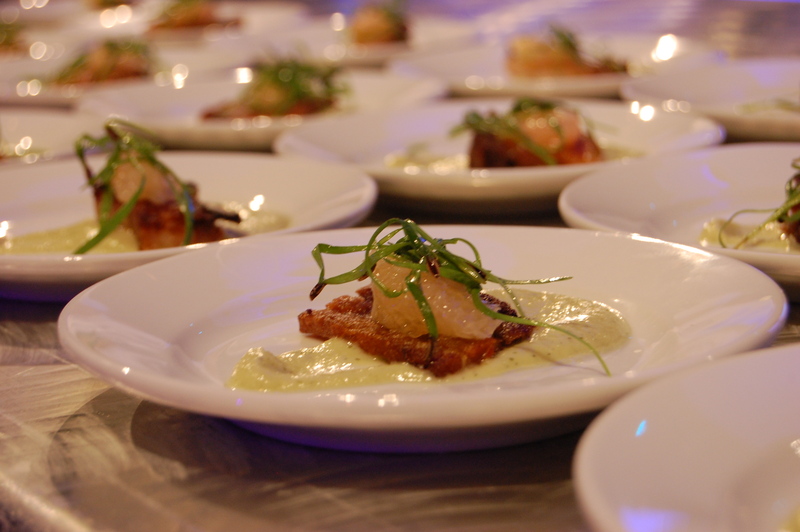 Over 1000 guests are expected each Saturday so planning is key in delivering a great dish! We travel in Reefer Trucks to our events. 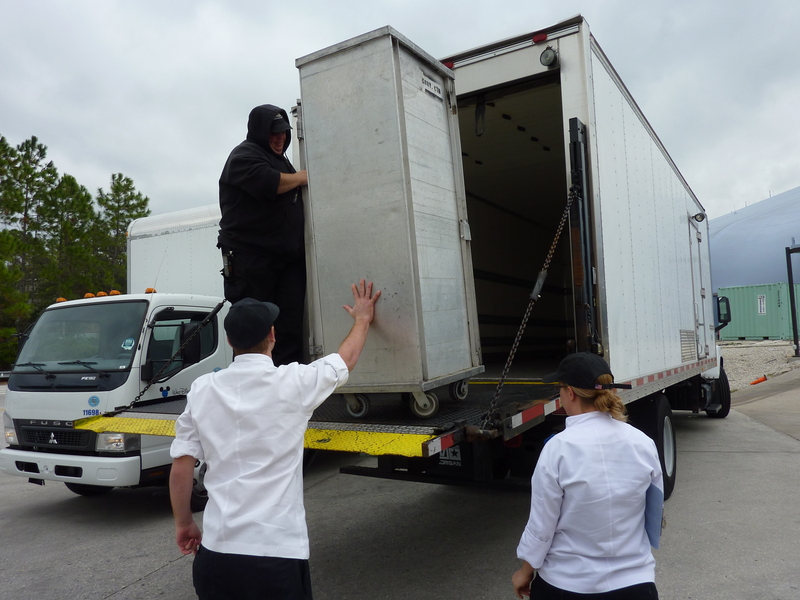 Trucks are in and out of the backdock area all afternoon, unloading trams, hotboxes and coolers filled with the chef’s mise en place. 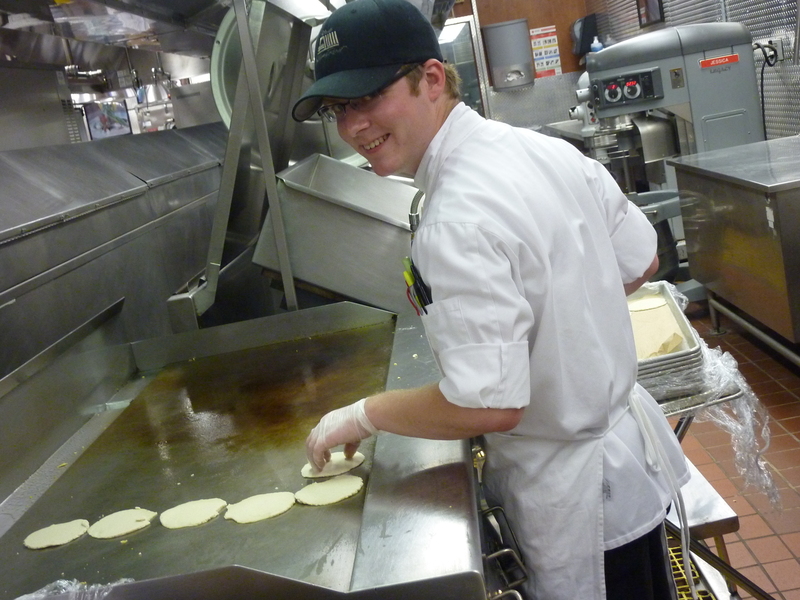 Chef Joe directs the team in setup to create a good flow of cooking and building plates. The back hall of the World Showcase Pavillion was peaceful before the hustle and bustle started! 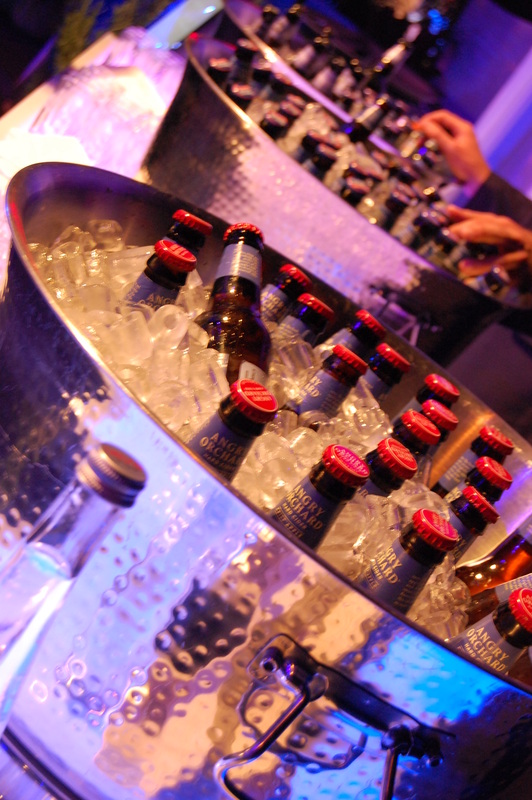 I look forward to going to The Party For The Senses each year, it’s always fun to see old friends and meet new people! 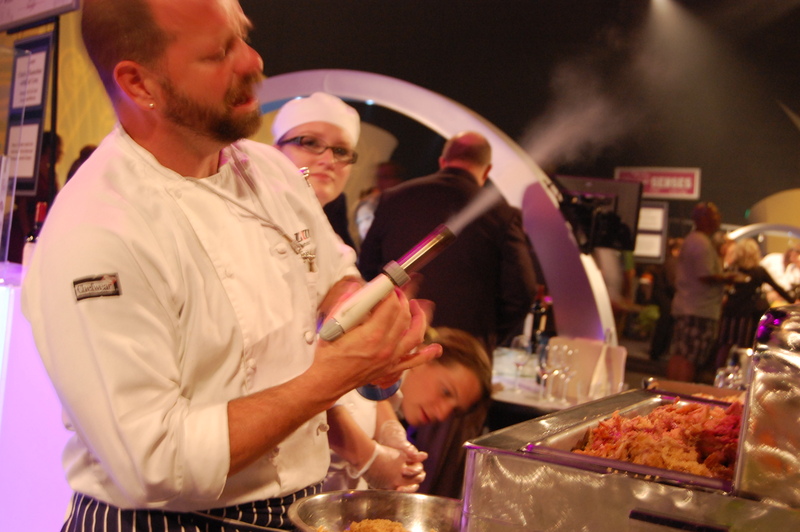 Not to mention to see and taste what other Chefs are doing! 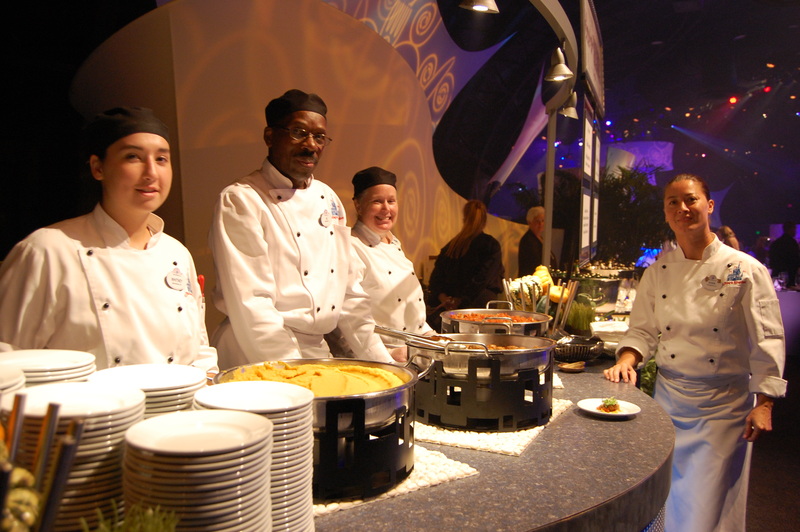 The Catering Kitchen was full of energy! 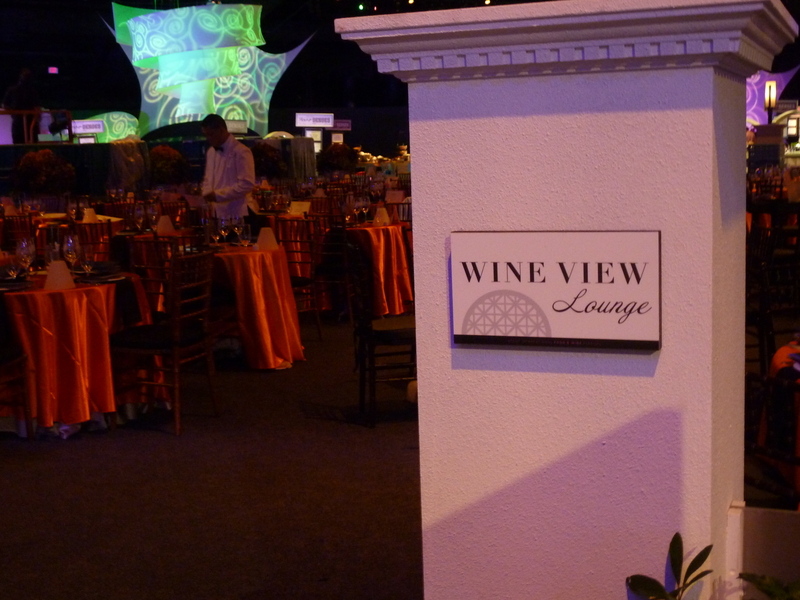 Some of the guests are lucky enough to be welcomed into the Wine View Lounge. 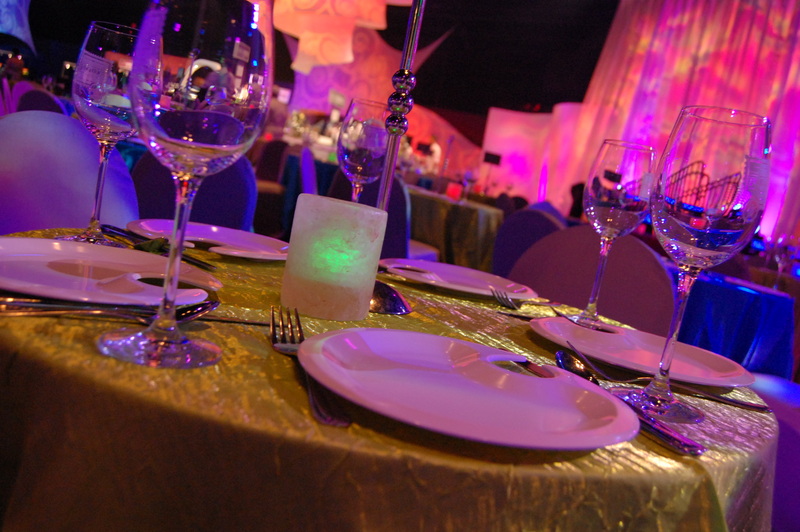 For a little extra money, these guests are brought into the event earlier and have a lovely lounge to enjoy. 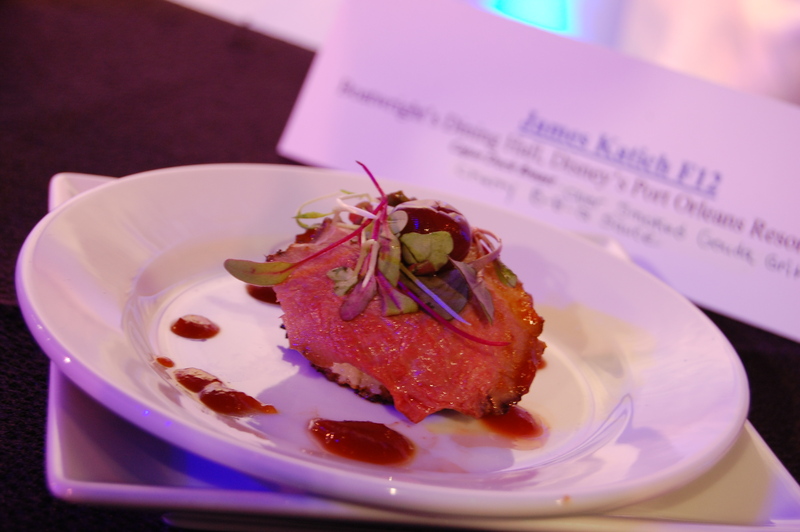 Every week the Chefs of Park Events Operations come up with a new, trendy dishes to offer these guests. 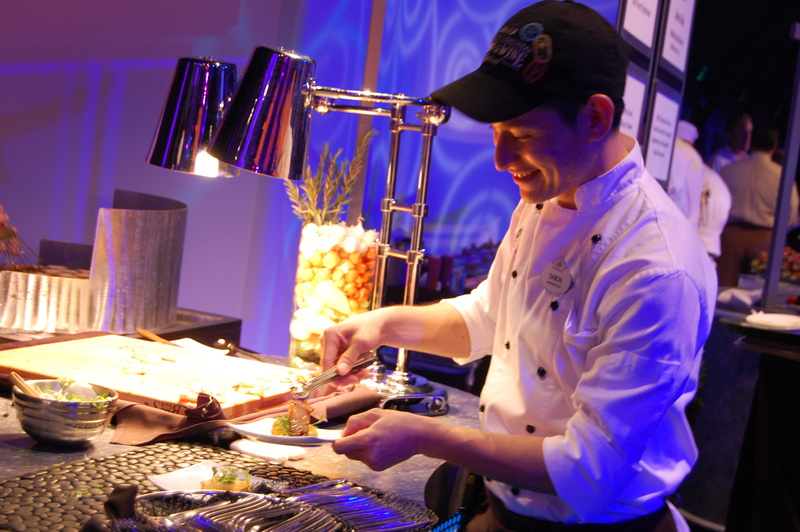 The WIne View Lounge offers guests an early entrance, extra seating, a few extra surprises from the Chefs! 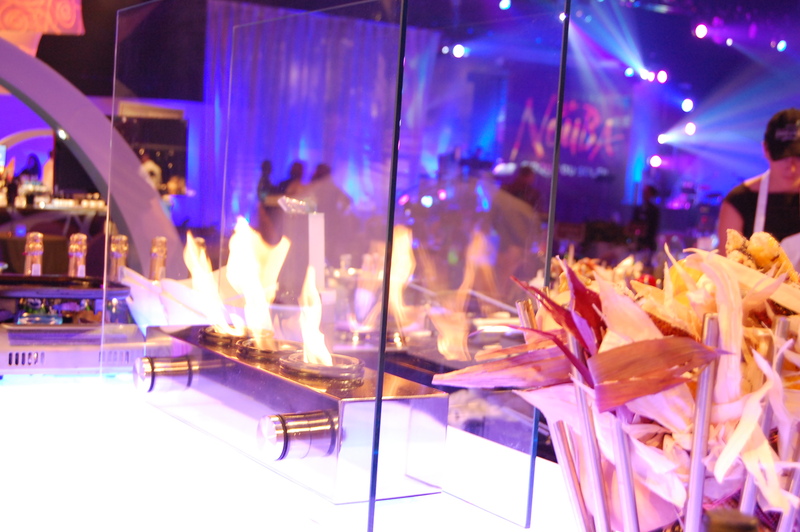 An intimate WIne View Lounge table in the midst of a premier event! Wow! 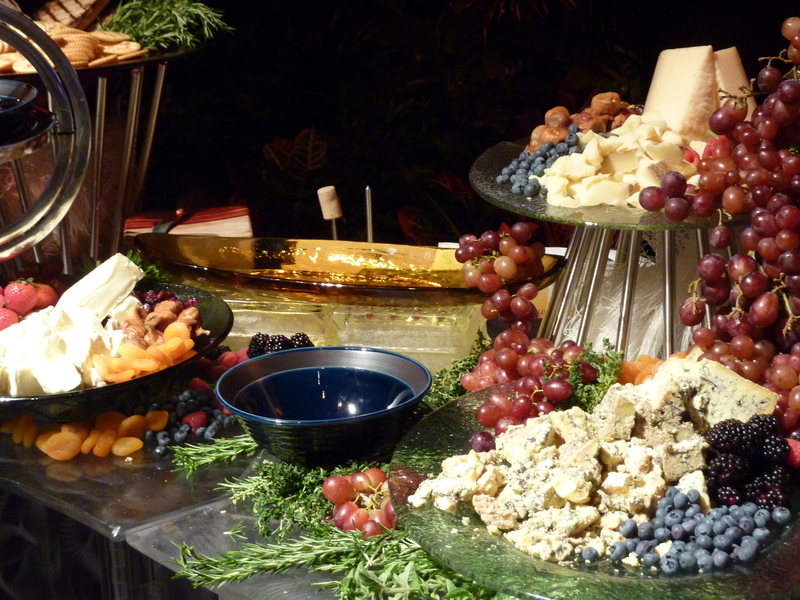 WIne View Lounge guests enjoy mouth watering cheese offerings. 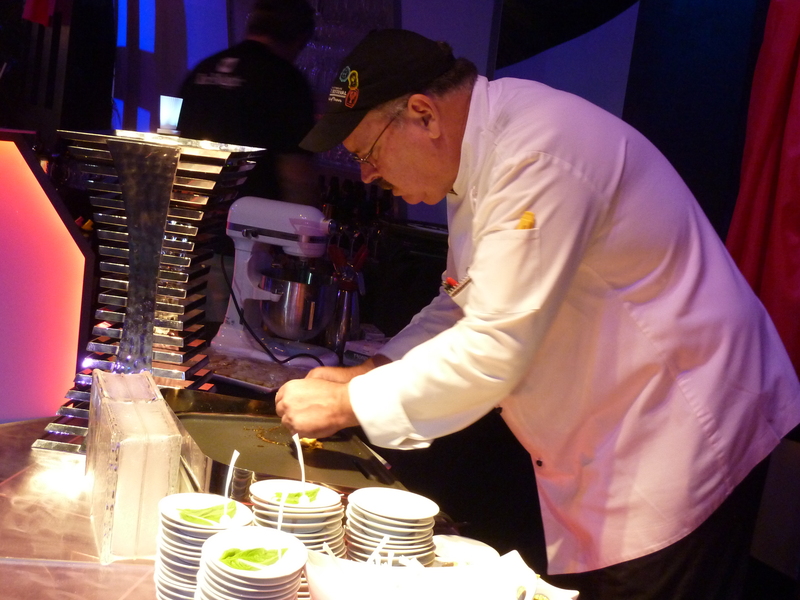 Chef Dale prepares for the Wine View Lounge guests. In the Wine View Lounge the buffets float! 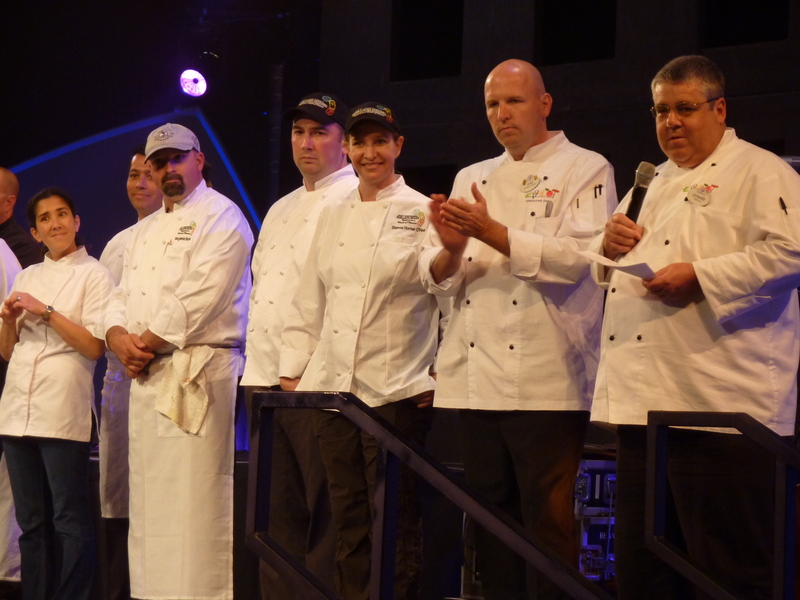 Before the event starts each week the Chef de Cuisine of Park Event Operations and Executive Chef of Epcot welcome all the chefs and their teams, and recognize the Events Team that spent all year planning. 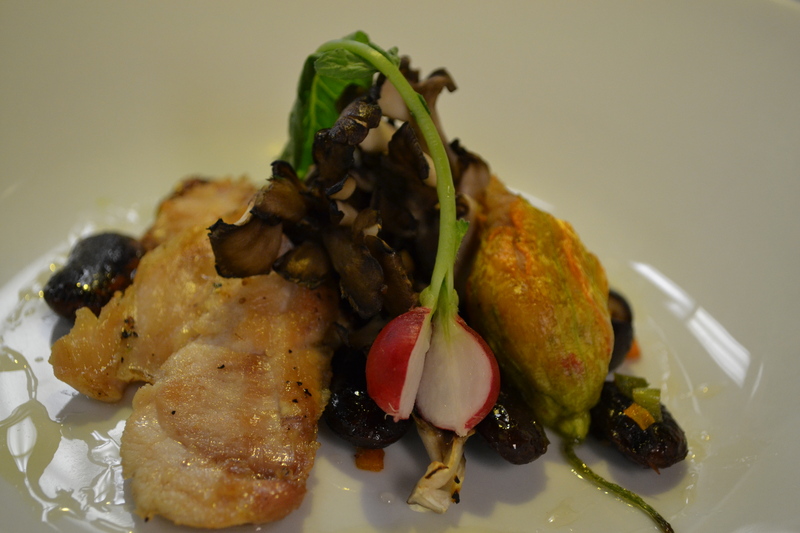 Each Chef then introduces themselves and briefly describes their dish of the night. Chef Leonard, the Chef De Cuisine of Park Event Operations welcomes the chefs and their teams and goes over the flow of the evening. 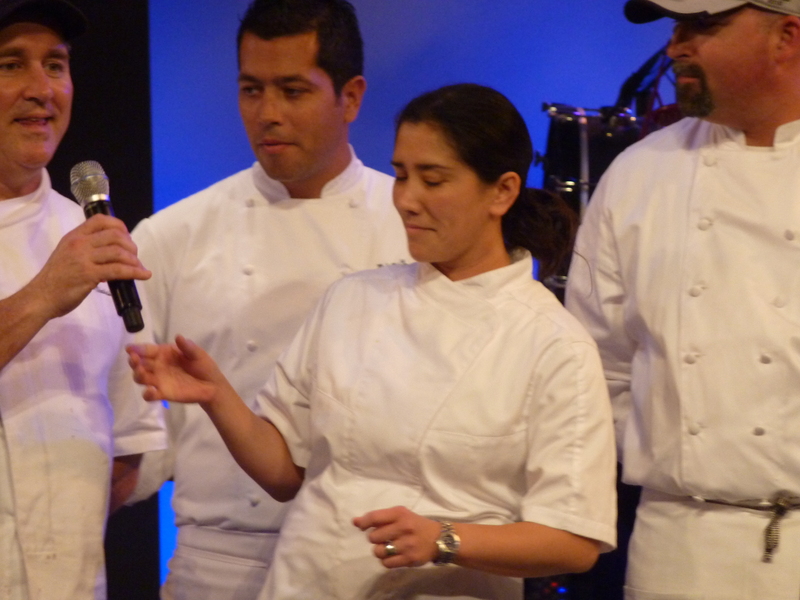 Chef Celina Tio describes her dish and passes the microphone off to Chef Ken Vedrinski. 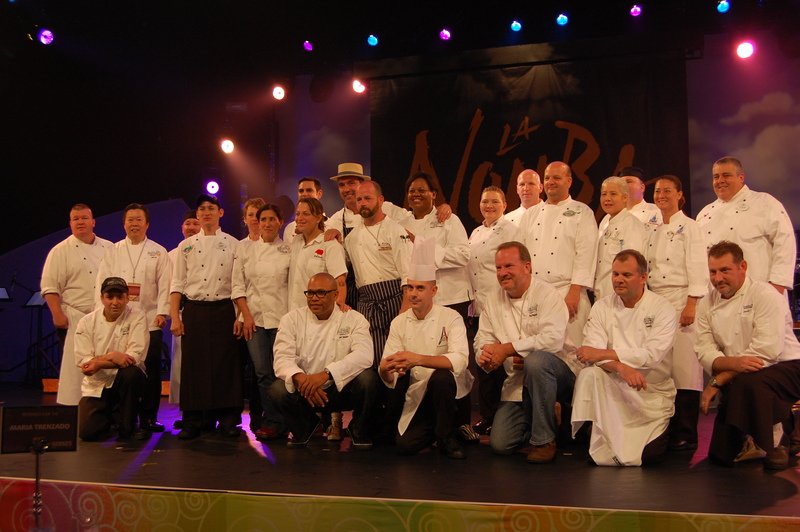 Here is a group shot of all the guest chefs- that is a TON of talent! 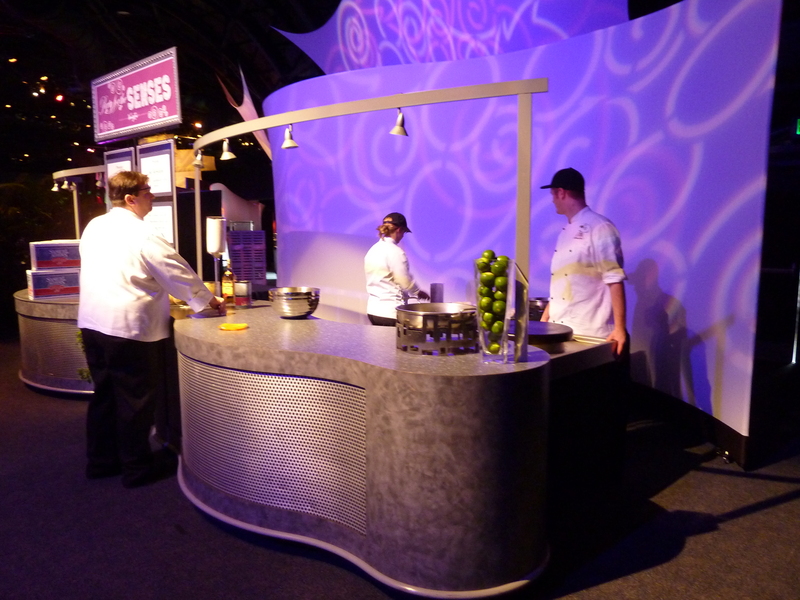 Chefs bring a demo plate to the center stage so everyone can see what will be served before the event starts. 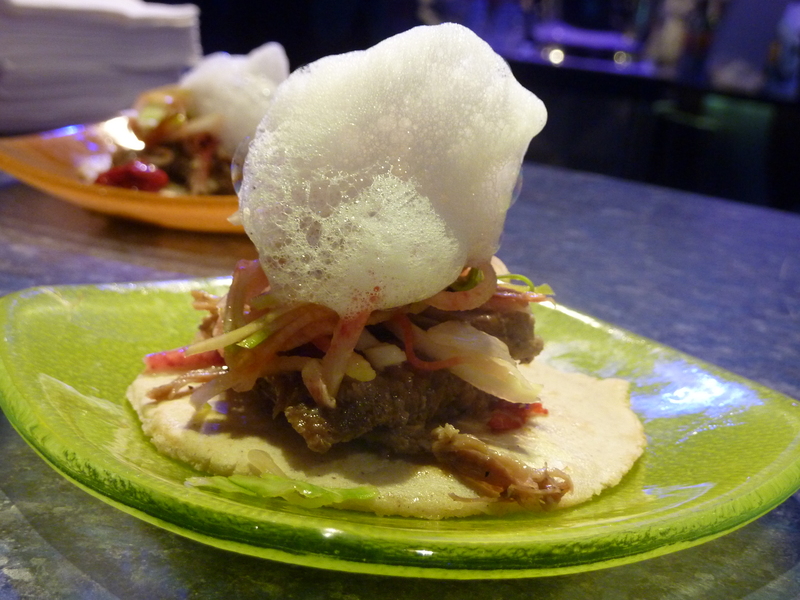 The dishes had a huge range and offered so many choices. 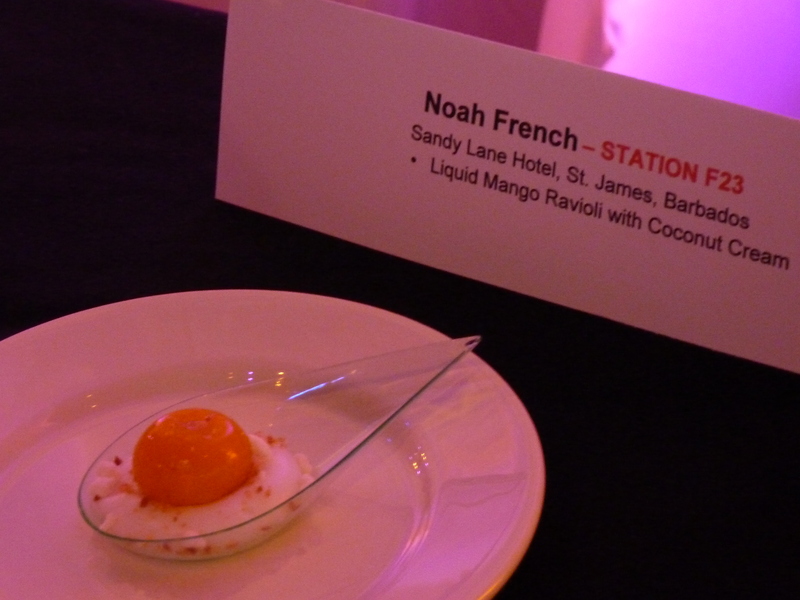 Chef Noah French of the Sandy Lane Hotel was back this year with a Molecular Gastronomy inspired dish! 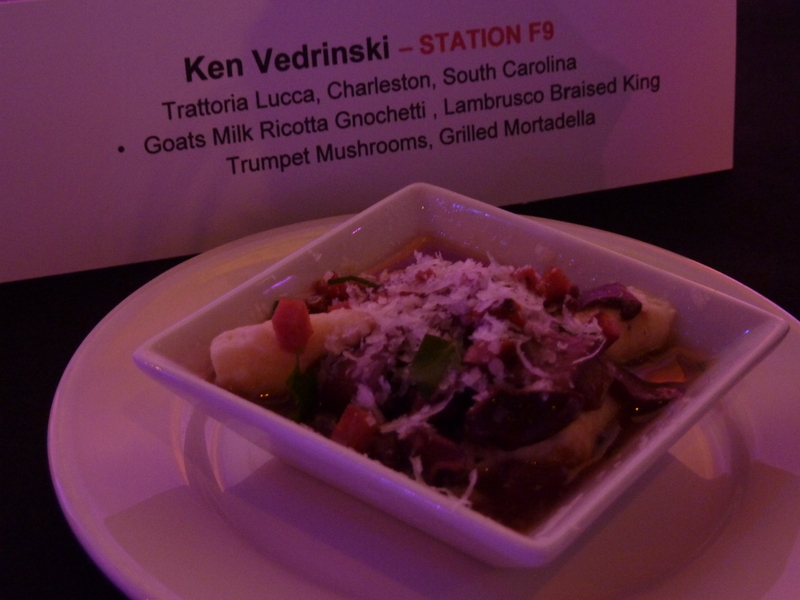 Chef Ken Vedrinski of Trattoria Lucca in Charleston, SC brought his renown talent to the Party For The Senses! 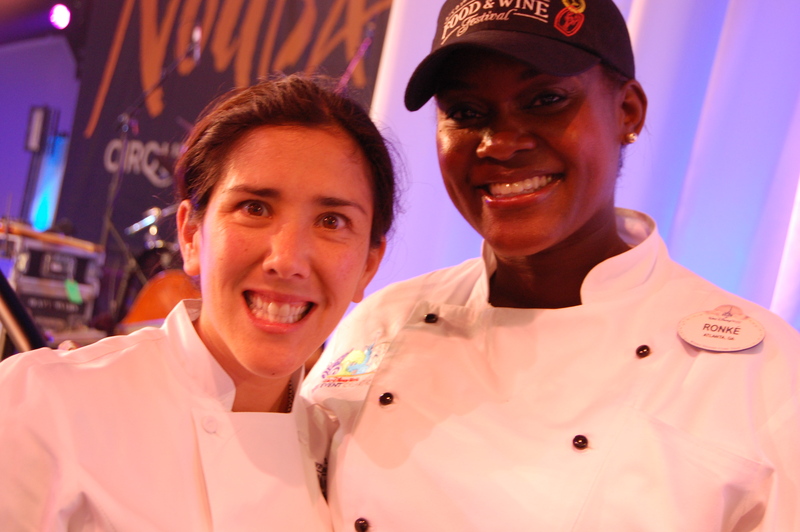 Charleston Chefs are World Class! 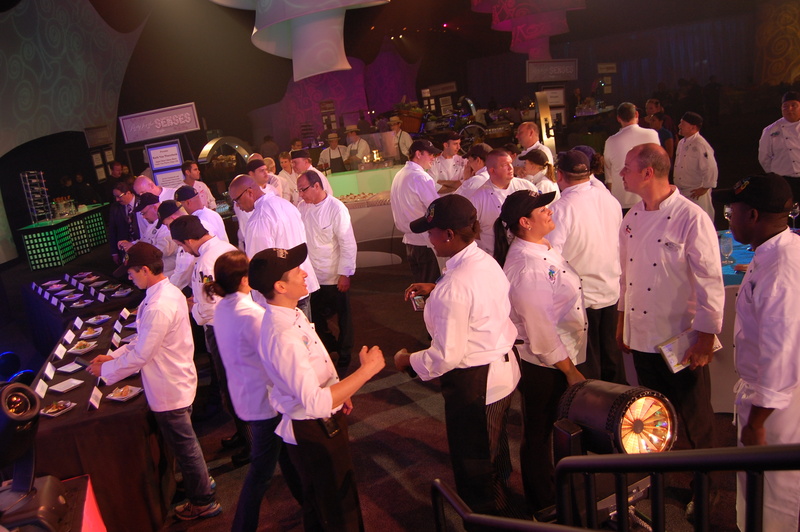 The event would start soon and it was time for all the Chefs to organize their teams so we would be ready for the crowd of 12oo. 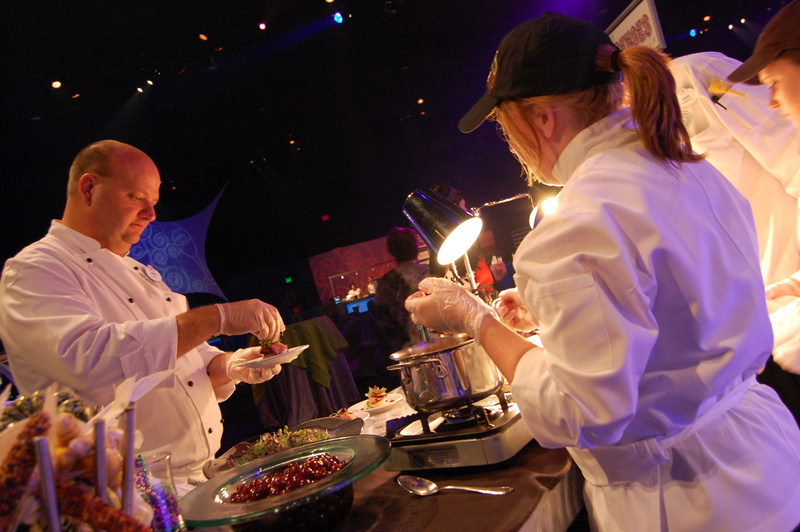 Chef Damon coordinates with all the guest chefs each week and ensures his team is ready to help create an amazing night for all! 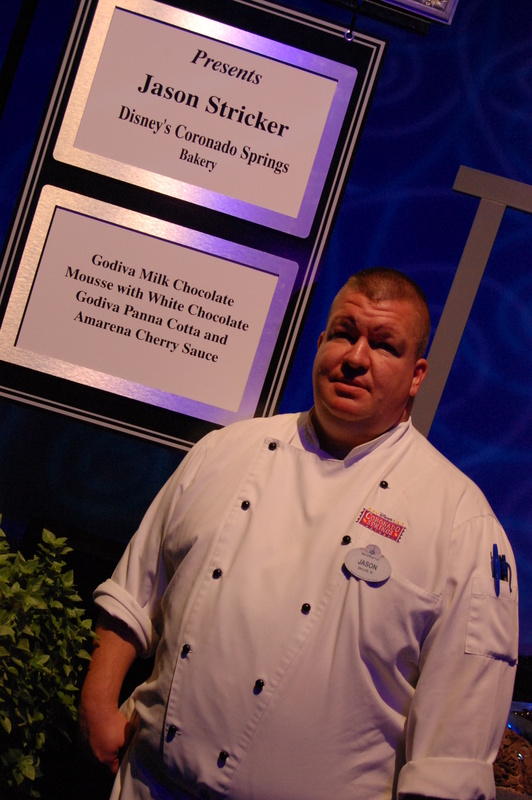 Chef Jim of the Magic Kingdom instructs his team before service starts. 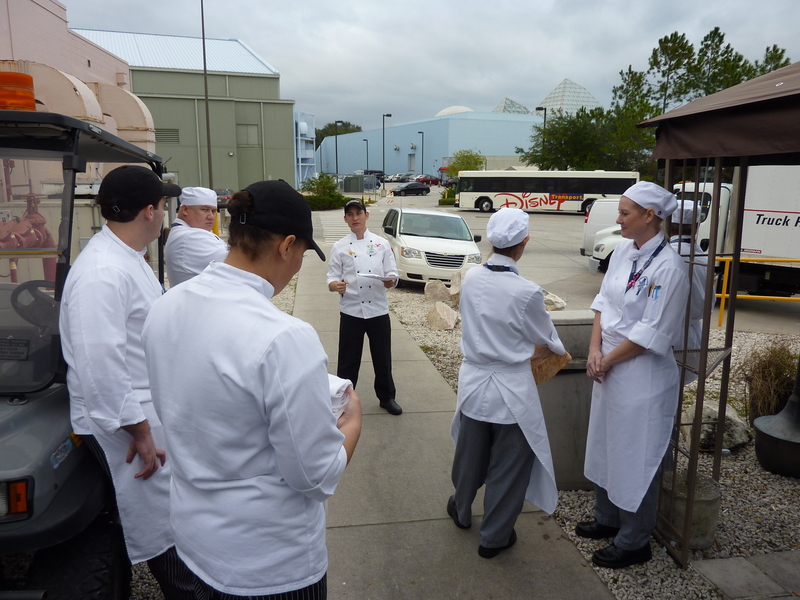 Chef Celina Tio guides her team before the guests arrival. 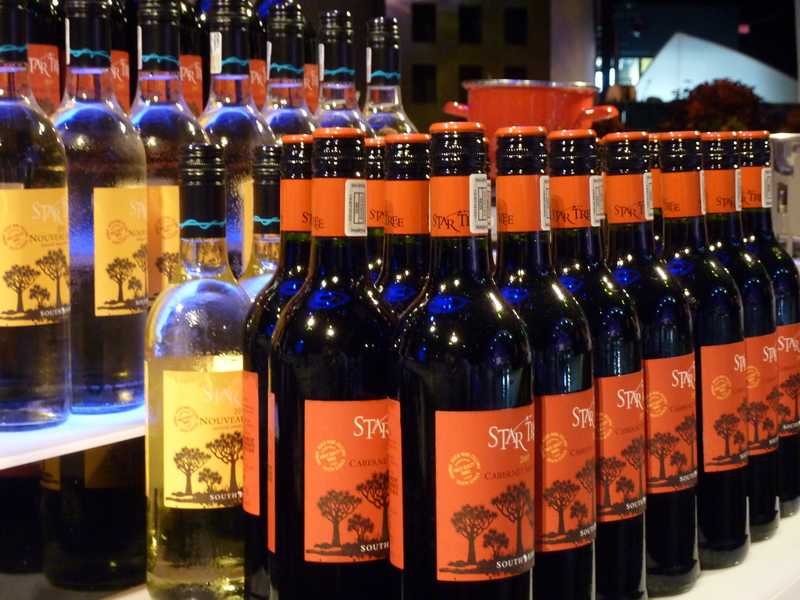 Star Tree Winery would be a popular table amongst the guests! 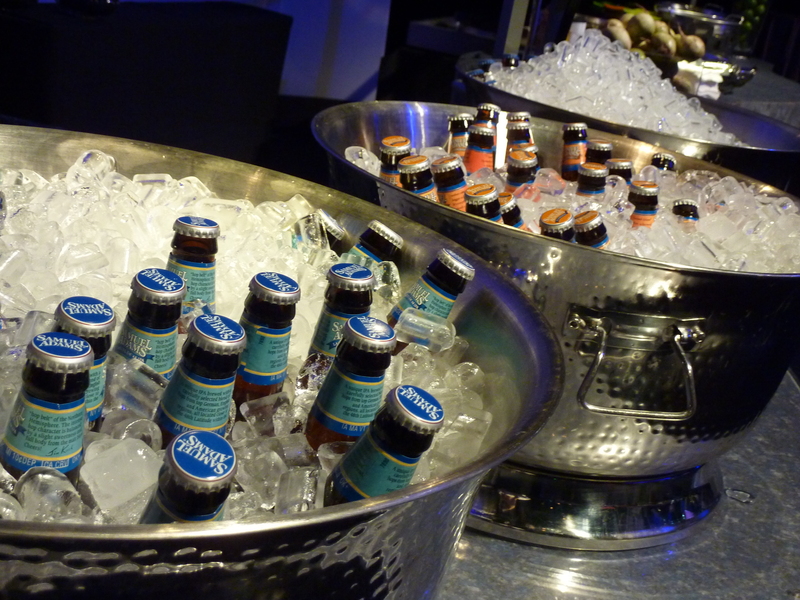 Sam Adams offered their Boston Lager, Octoberfest and Latitude 48 IPA. Not a bottle would go "unpopped"! Cheers! 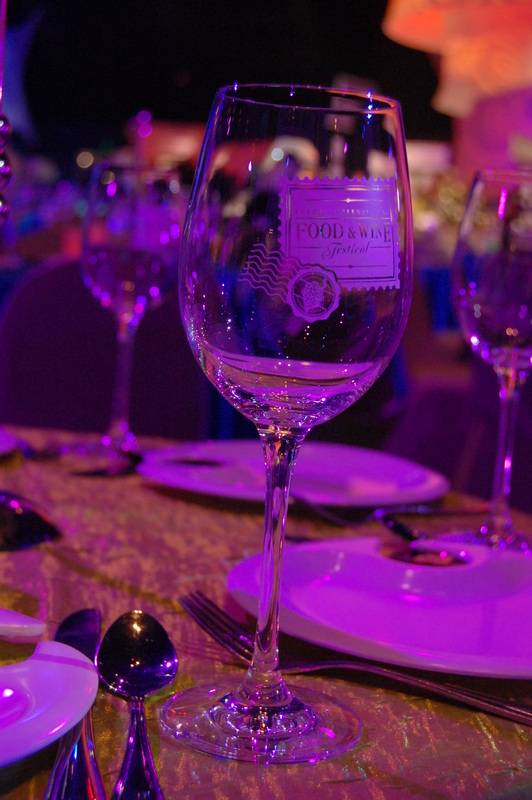 The Party For The Senses made Green efforts this year, giving guests the options to rinse and reuse their wine glasses! 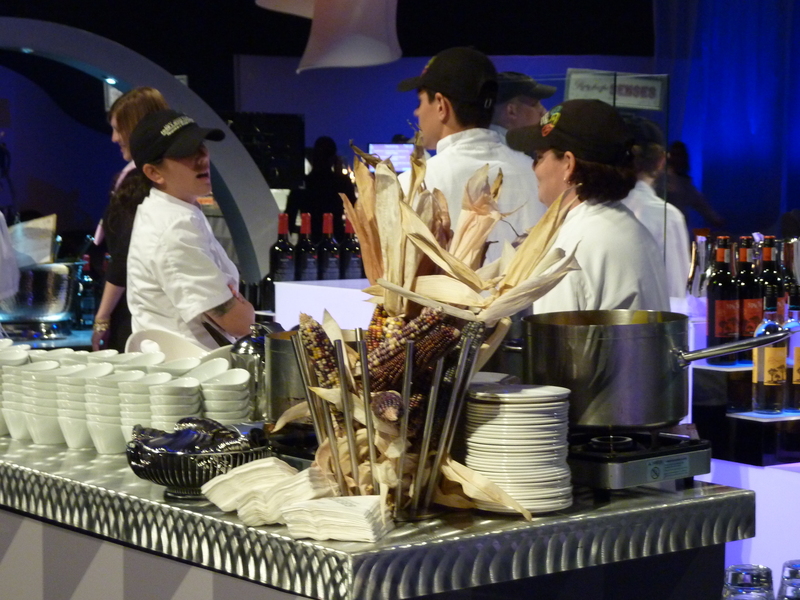 The moments before an event start can be the most satifying for a chef, all the work is done and the chefs take a breath and wait to delight guests with their insprired dishes! 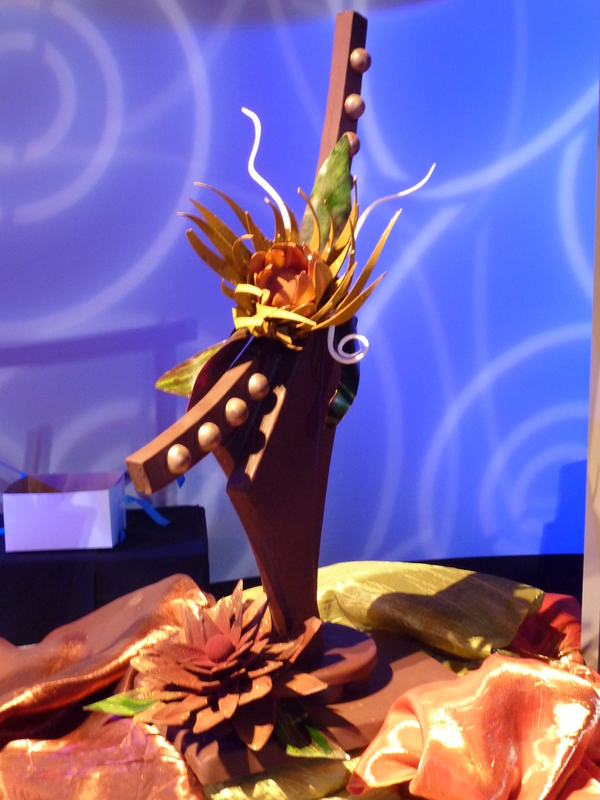 The Chefs of the Contemporary Bakery created a breath taking chocolate sculpture to display! 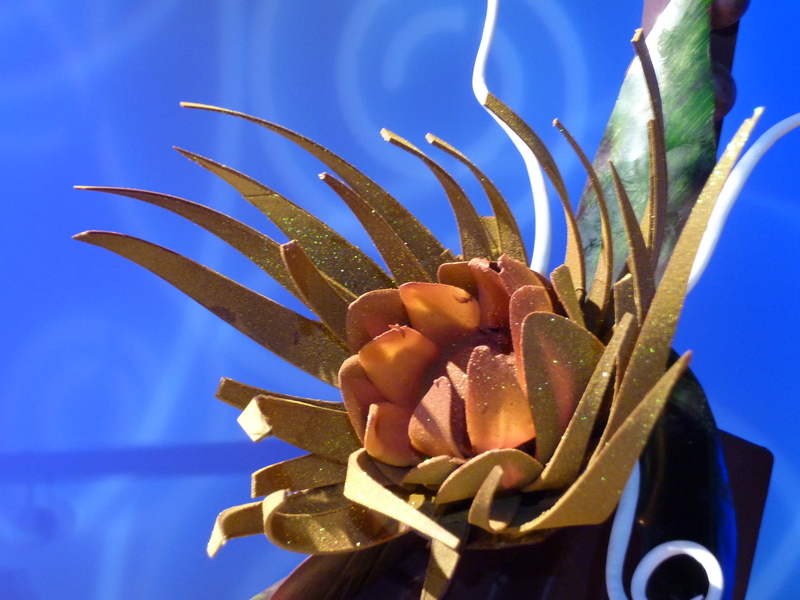 This chocolate flower is AMAZING! 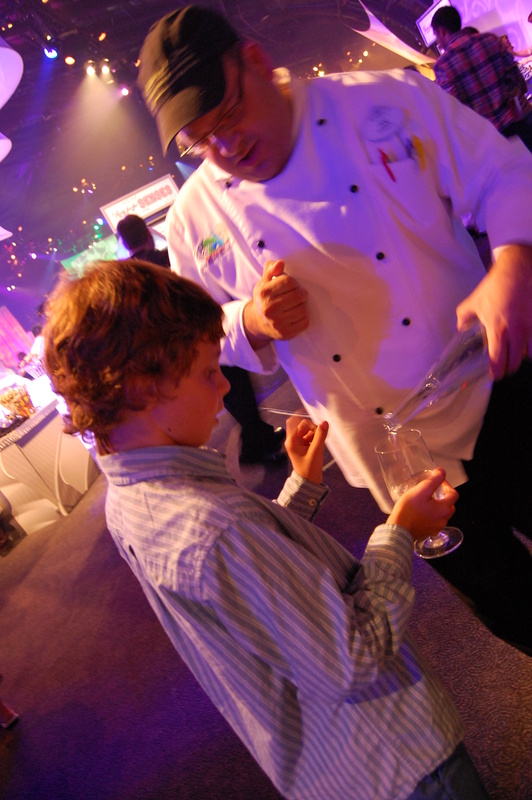 Chef Ben of the Contemporary was going to be a popular table! 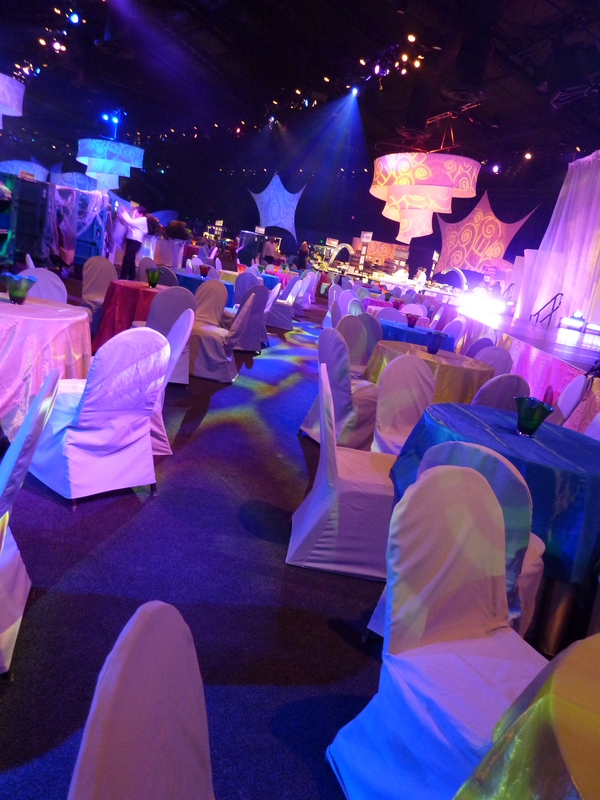 Before the Party For The Senses guests arrive, all is set and ready! 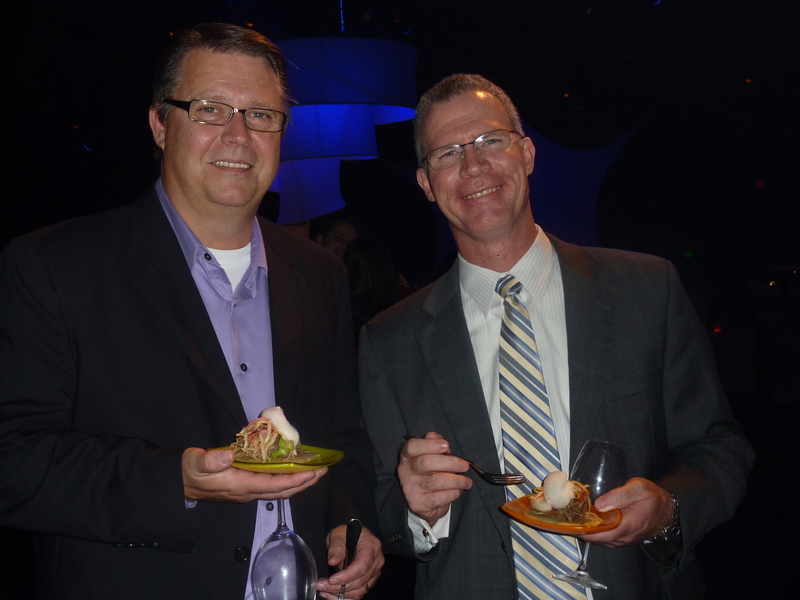 George and Pete of Park Event Operations were nice enough to taste test! 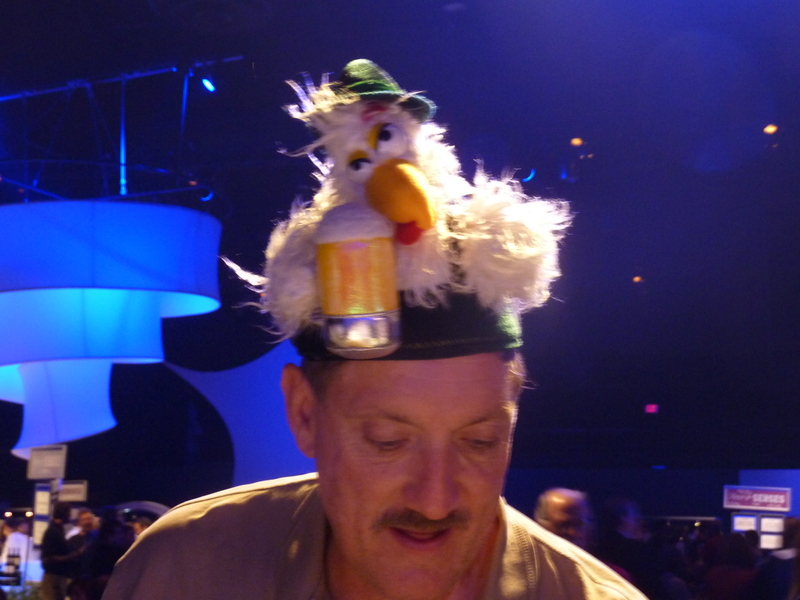 We waited all night for this gentlemen to come to our table so we could get a good look at his hat- Fabulous! 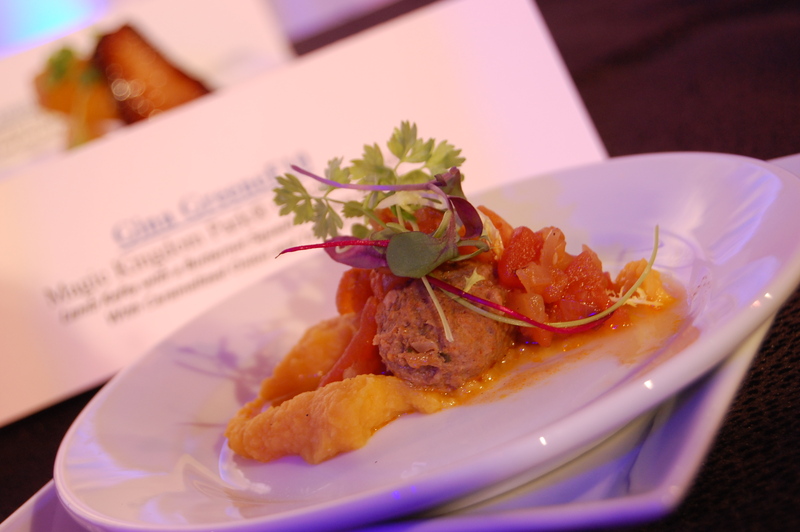 As every year we had a great time at The Party For The Senses and had so many delicious dishes by talented chefs across the world! 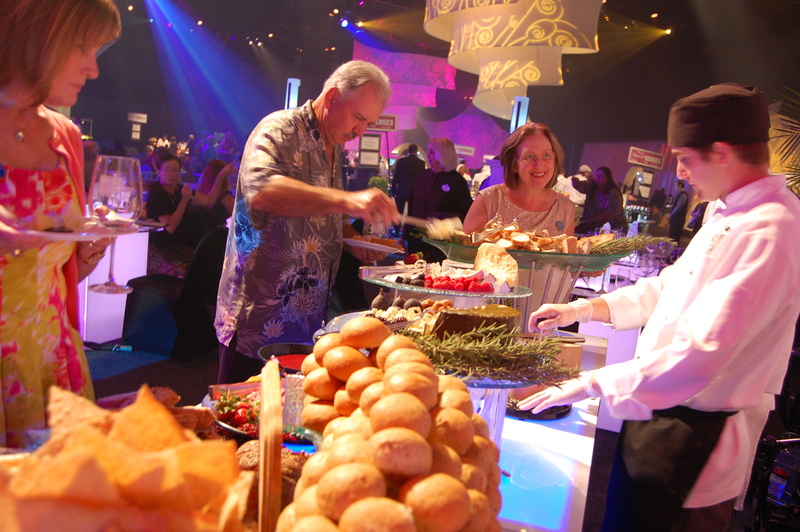 Party For The Senses is an event looked forward to all year. 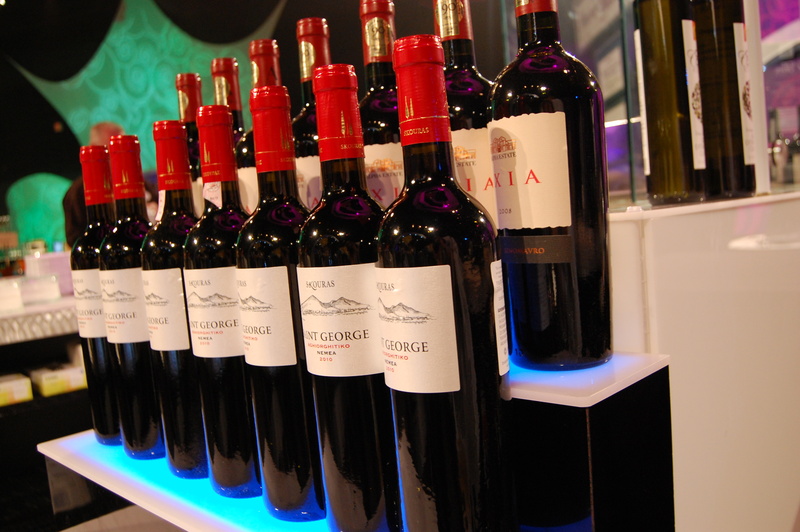 Each year world class wineries, and vendors are there offering a range of wonderful wines and beers. 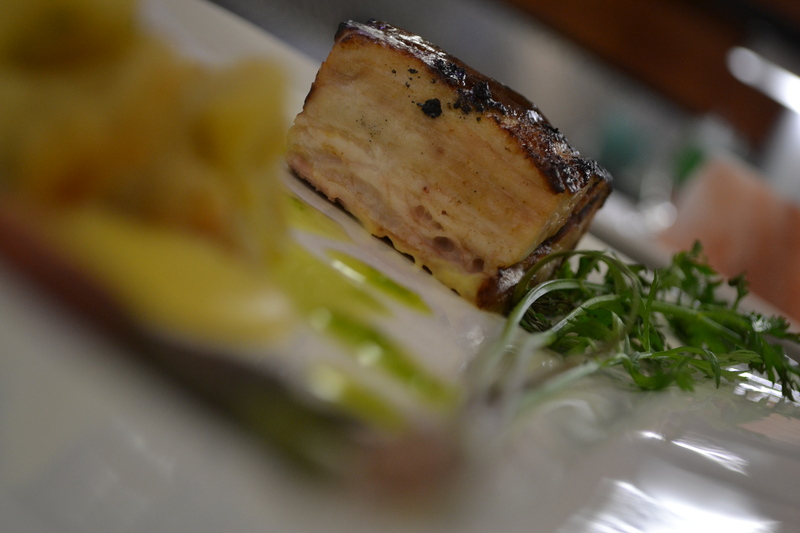 The Chefs bring their most creative and seasonal dishes and ensure that even the fussiest diner has something to remember! 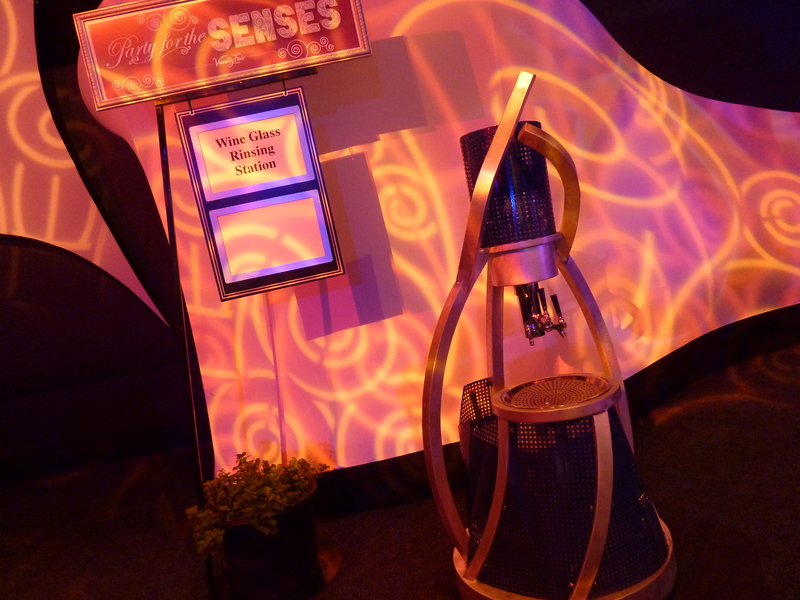 If ever a chance to attend the Party For The Senses Event, I highly recommend it! 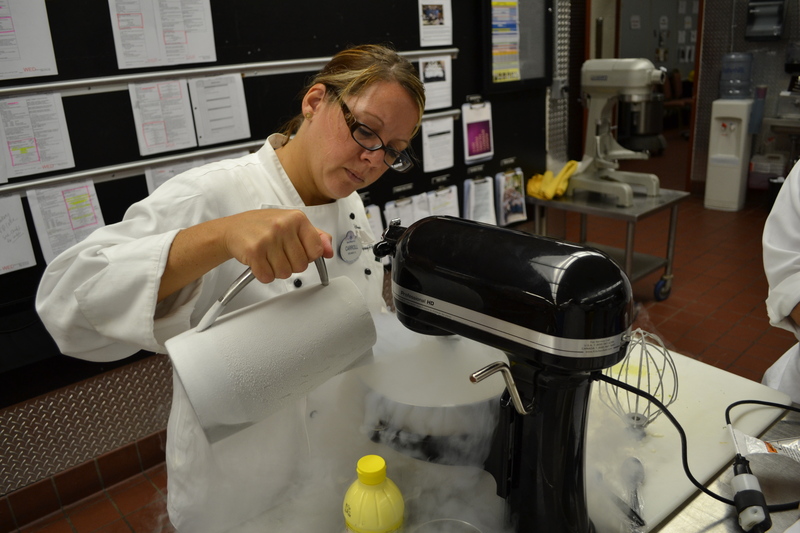 Key Lime Pie Ice Cream- Top Chef Nitro Style! There are a ton of cooking shows on television today. Some I love, some are just “ehh”, and some are just garbage. The shows I don’t like are the ones that make professional kitchens and chefs look ridiculous. 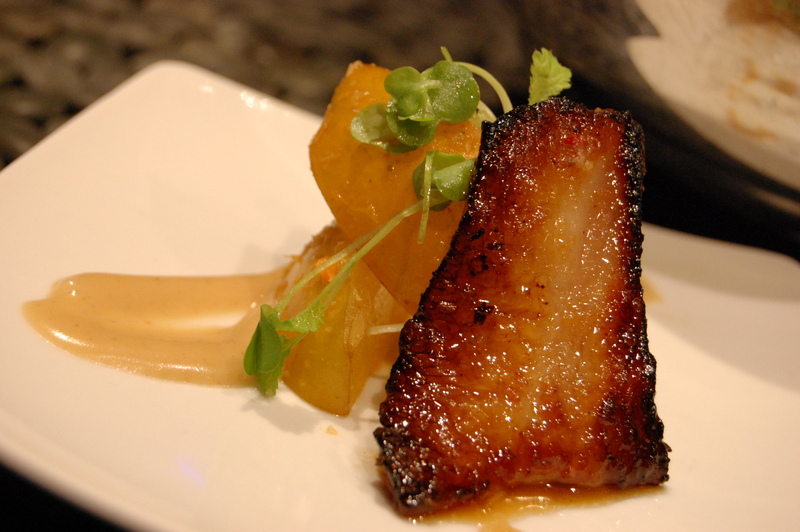 Many of my friends and family ask me after seeing Hell’s Kitchen, “Is that what you do?”…So I’d like to say to everyone, while there are times when chef is screaming in our kitchen, there is no Gordon Ramsey running around yelling at seemingly inexperienced “chefs” that don’t know how to saute a piece of fish. It just isn’t reality…. 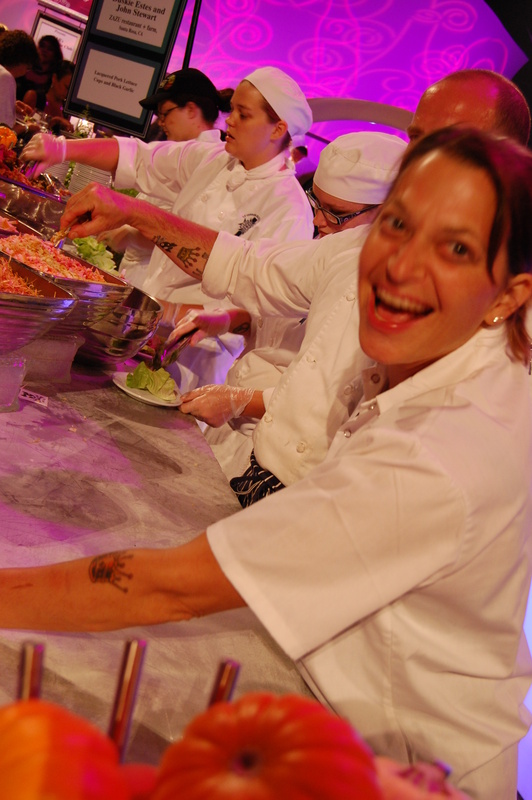 I am a Top Chef fan, I think Bravo does a great job, capturing the energy and vibe of a kitchen. When my friends and family chat me up about cooking, our conversations often lead to Top Chef. I love the creativity of the chefs, the familiar competition amongst them and the accurate portrayal of the stress all kitchens have. 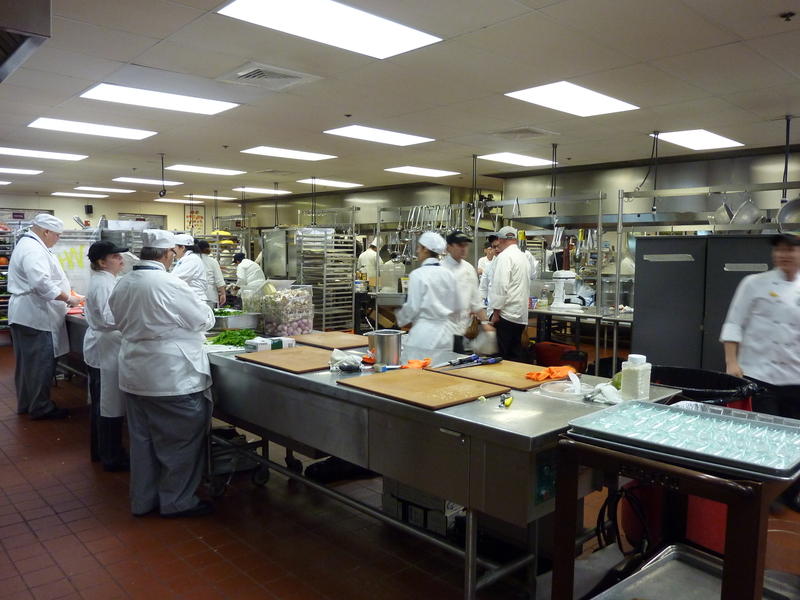 The producers really capture it well, so I love for friends outside of food and beverage world to watch, so they can understand the day to day life in a kitchen. We have a lot of kitchen “toys” at work, some of which are used by the chefs on Top Chef. 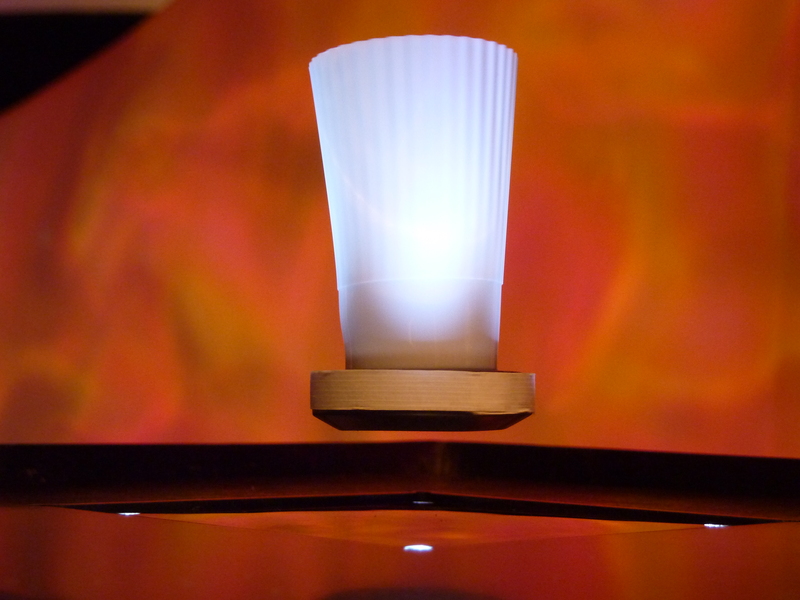 The one fault I see in the show, is that the contestants use new, cutting edge cooking techniques, equipment, presentations and ideas, but don’t give a clear explanation for the viewers. (Perhaps they need a 2 hour time slot). 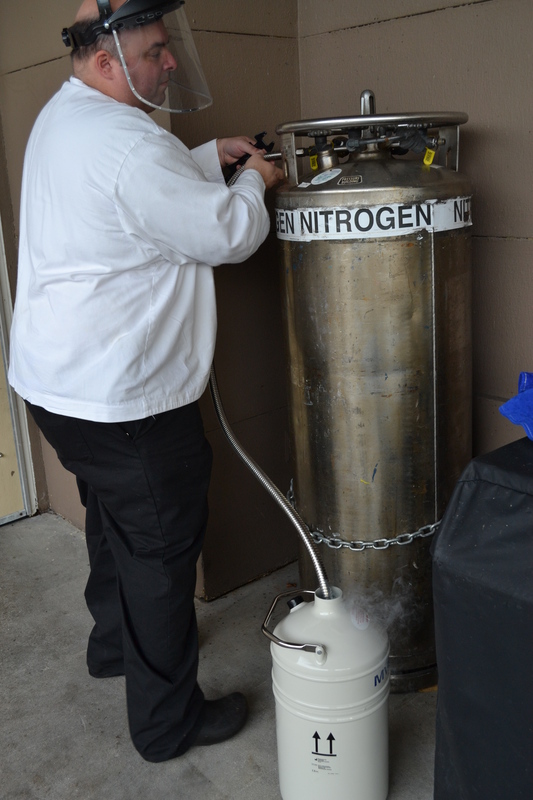 We recently had a “teach and learn” at work using liquid nitrogen to make ice cream, a method I have seen on Top Chef fairly often. 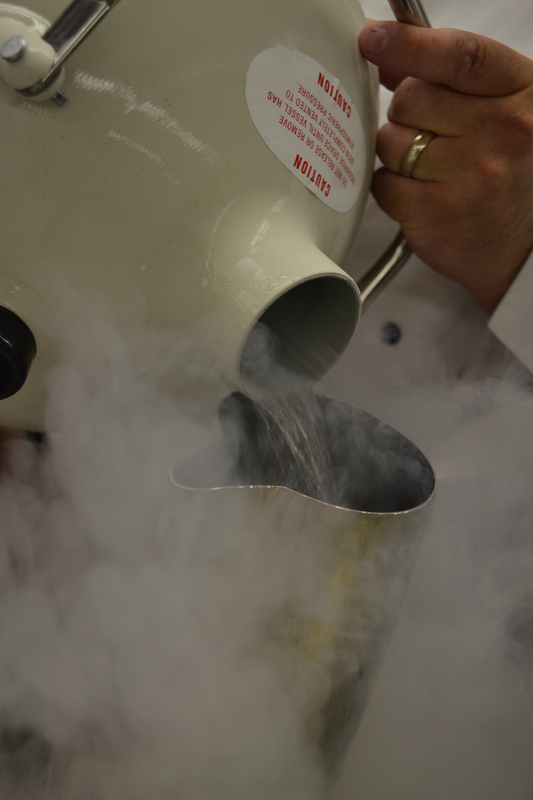 So I thought I would share the process, while you might not have a liquid nitrogen tank at home, you can at least know what the heck Richard Blais is doing! 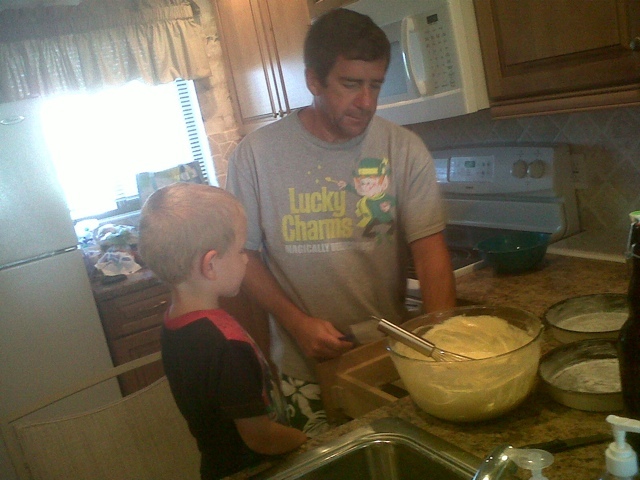 We used Paula Deen’s recipe for Key Lime Pie filling, which is delicious! 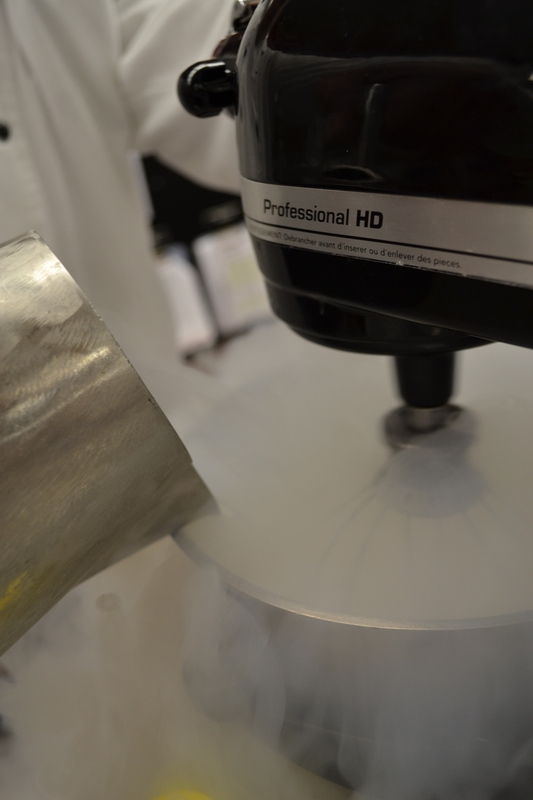 Of course we used liquid nitrogen, but if you can make it at home in your ice cream maker too! 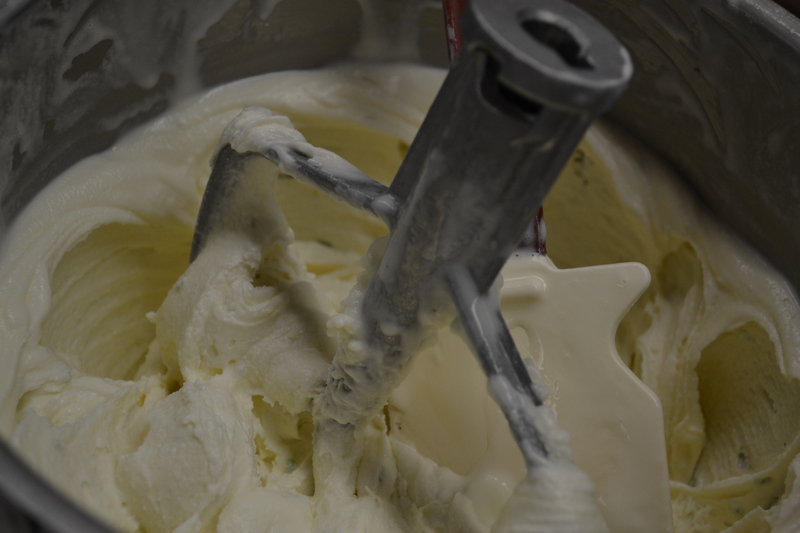 In a large bowl, with an electric mixer at medium speed, beat cream until slightly thickened. Gradually add the sugar, beating until soft peaks form. Add condensed milk and beat until stiff peaks form. Beat in lime juice, lime zest, and half-and-half. 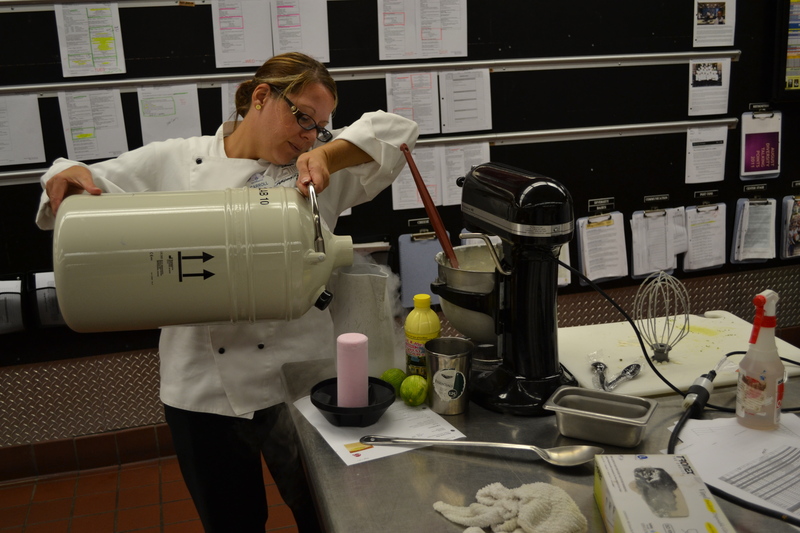 Now you are ready for the ice cream maker, they all have slightly different directions, follow the method of the maker you have at home. 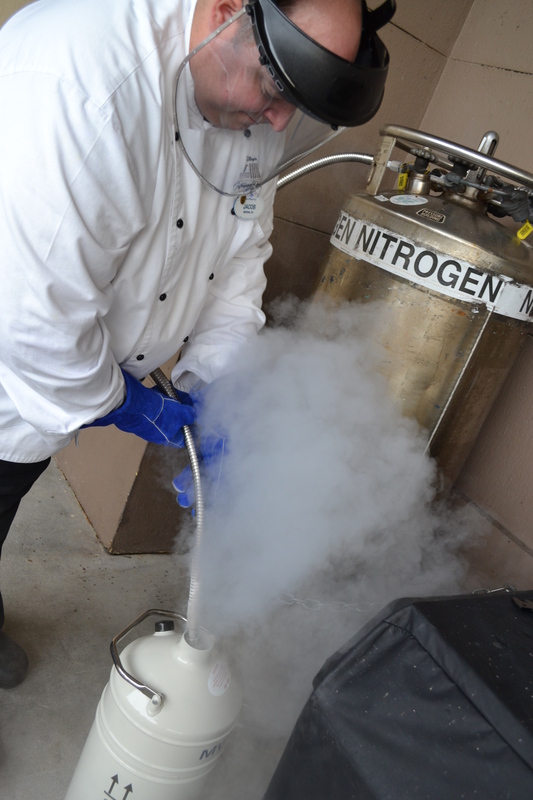 OR…go get yourself a liquid nitrogen tank, and do not forget the saftey mask and gloves! 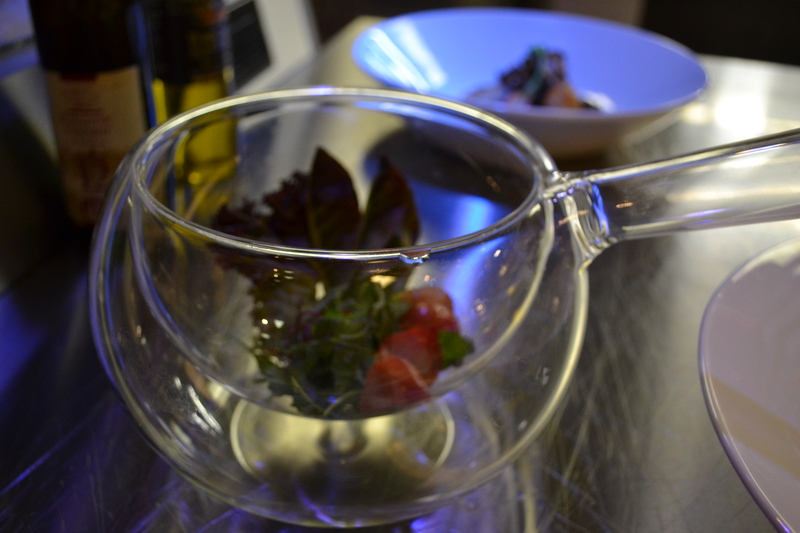 Pour the liquid nitrogen into a manageable pitcher. 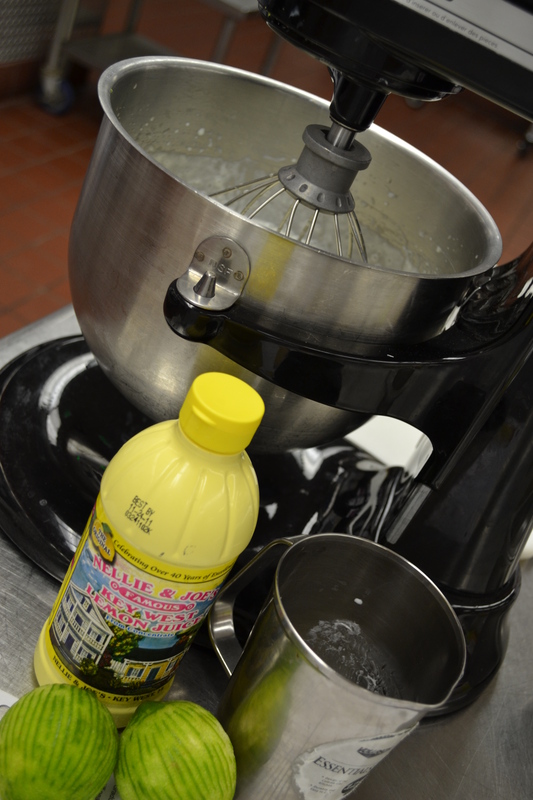 The Key Lime Pie filling is freezing in the mixer! It's so cool to have the "smoke" blowing all over the place. They should do this in high school science classes! I am refilling the pitcher, it takes a little more than I thought. A little more and it should be nicely frozen. It took just minutes! 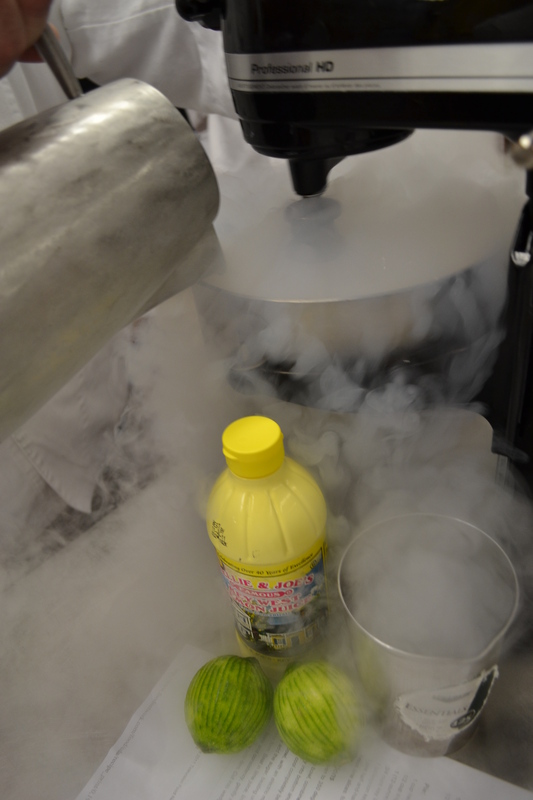 Voila, Key Lime Pie Ice Cream. Now I need a Graham Cracker Cone! 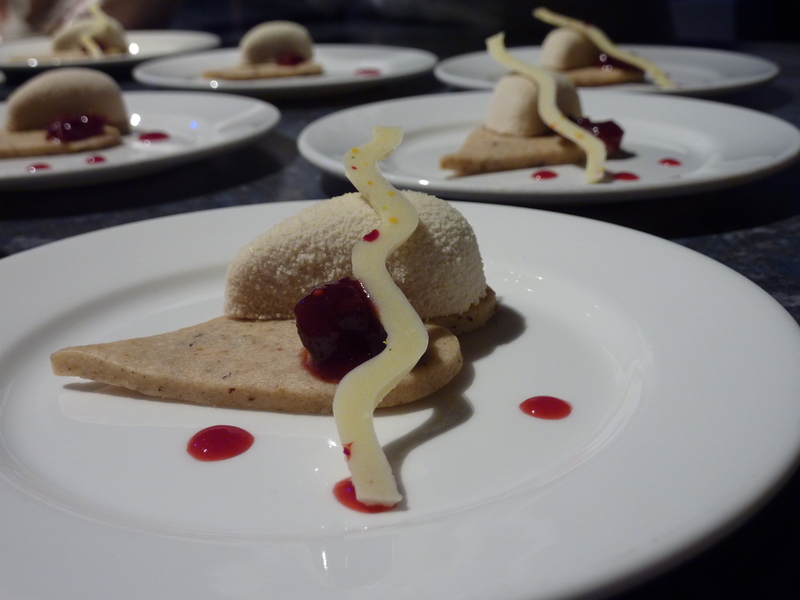 A few nights ago, we had an event in the kitchen. 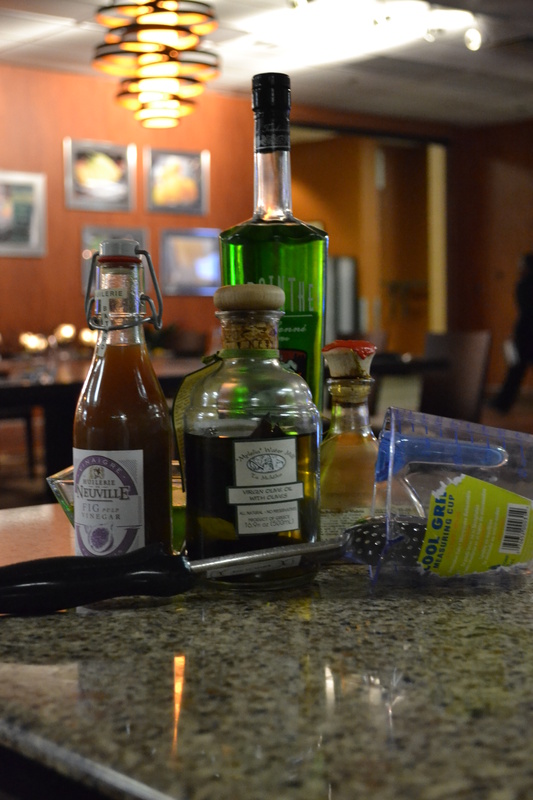 Now, we do these Chef Table Experiences fairly often, but so far they haven’t gotten old. We push the stainless prep tables out of the way, throw down a rug, move our “On Stage” cooking stations into the kitchen, hang a chandelier and put in a dining table and chairs….Voila, kitchen space turns dining space. 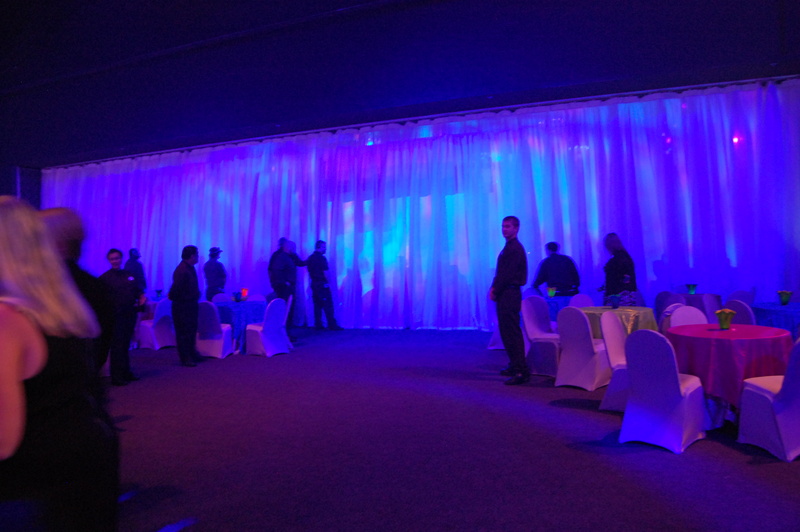 Our guests love it, we can seat something close to 30 people, and more if we go the reception route. 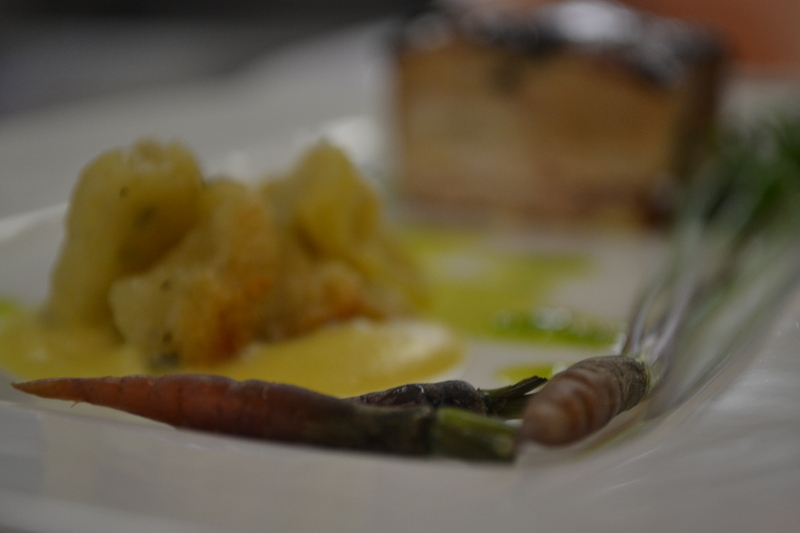 Thru the Chefs and Sommelier spieling courses and pairings, we establish a relationship with our guests. 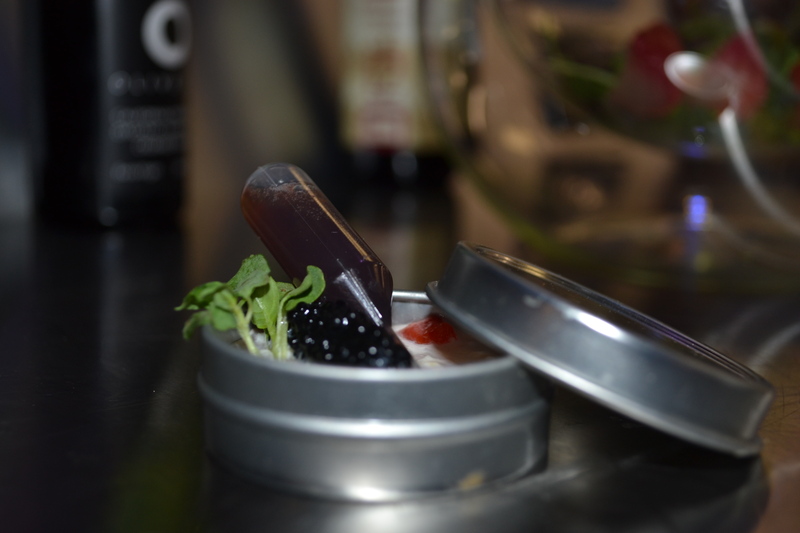 Some experiences are interactive for the group, rubbing truffle oil on pulse points or discovering the Miracle Berry, we create our own Umami. Storytelling and personality keep the crowd engaged and by the end of the evening, the entire staff has connected with the guests, leaving us all with wanting more. 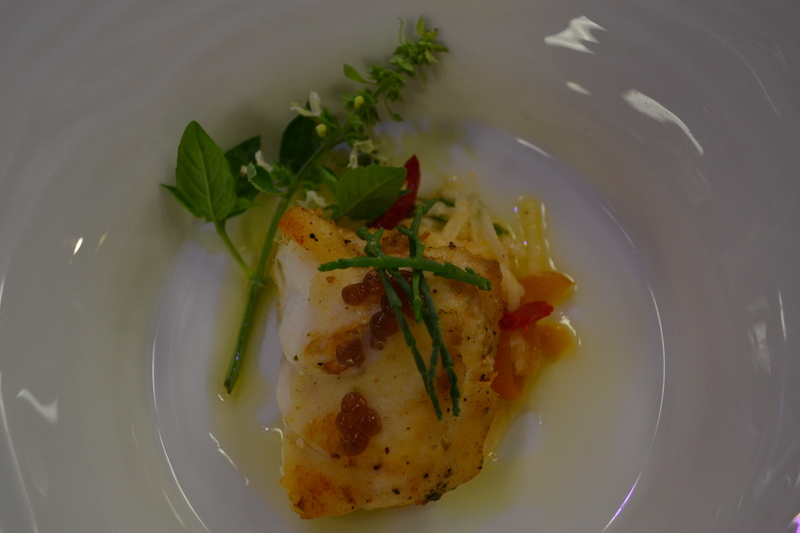 Of course the food is the star of the show, take a look at some of the dishes from the other night. Then go straight to the kitchen and cook 🙂 Bon appetit! 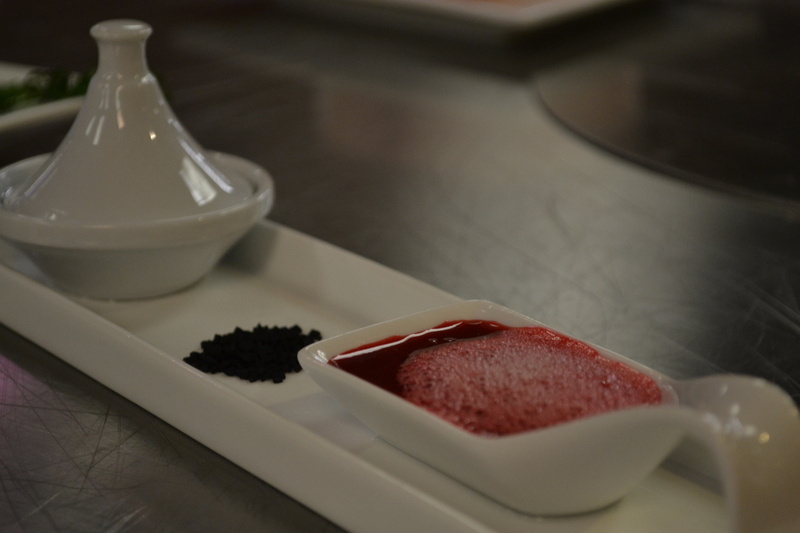 Strawberry Nitrogen Sphere, Citrus Foam, Hot Chili Pearls, Smoked Hawaiian Sea Salt. Have to admit, I didn't get to it fast enough to get a good picture- but you can get the idea. 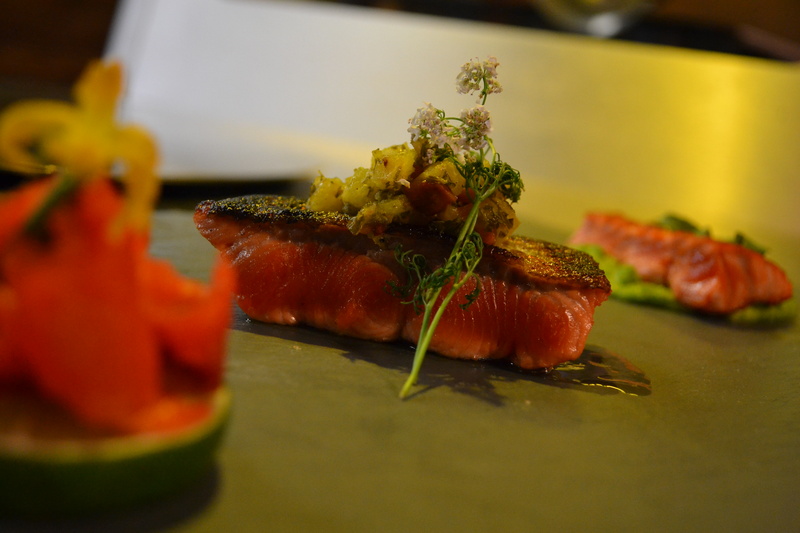 @copperriverwild - Copper River Salmon All the Way! Sir Ahmed and the Chicken. Could be the name of a storybook, haha! 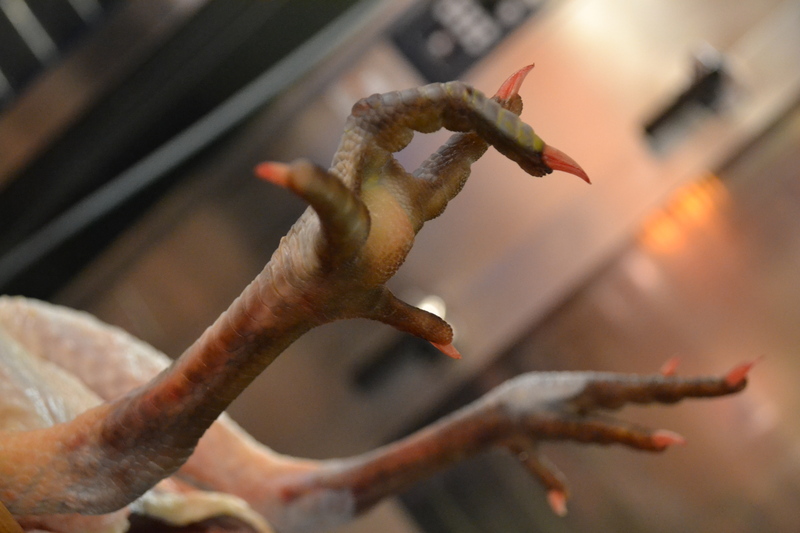 Chicken feet for tomorrow's soup! 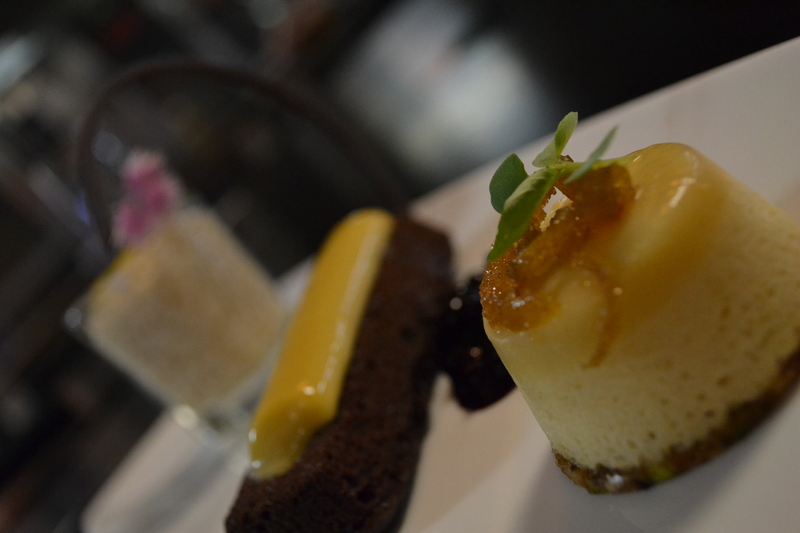 Everything but the Lemon- This was so good- SOO good!